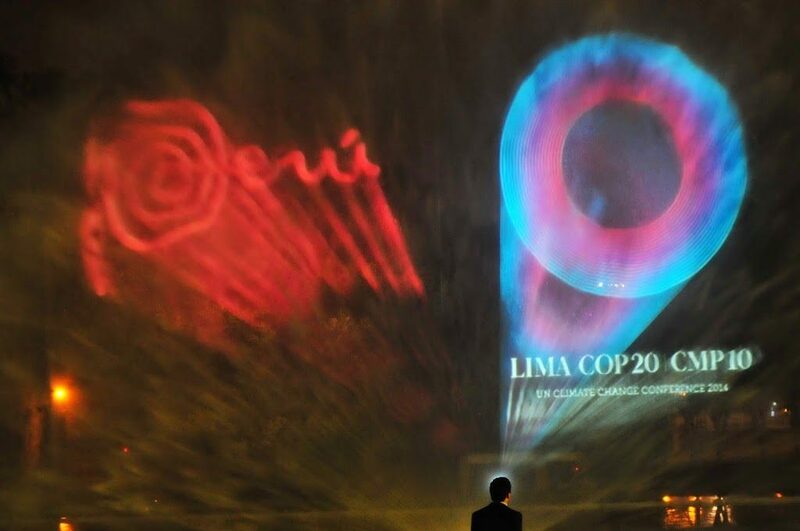 DCI provided transmission facilities at the 20th meeting of the Conference of the Parties to the Kyoto Protocol (COP20), held in Lima Peru for two weeks at the beginning of December. 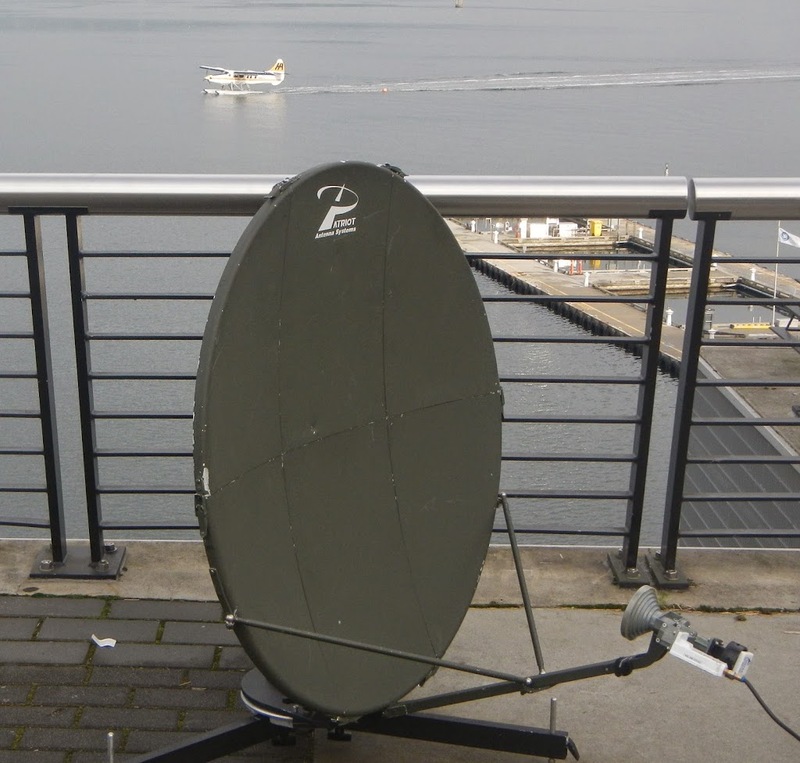 We deployed our second generation airline flyaway to transmit two SD or 1 HD paths in a 4.5MHz slot on the Satmex 8 satellite. The recent loss of Satmex 5 to inclined orbit has greatly reduced the occasional use capacity available on the Satmex fleet, one of our favorite for South to North one-hop coverage. 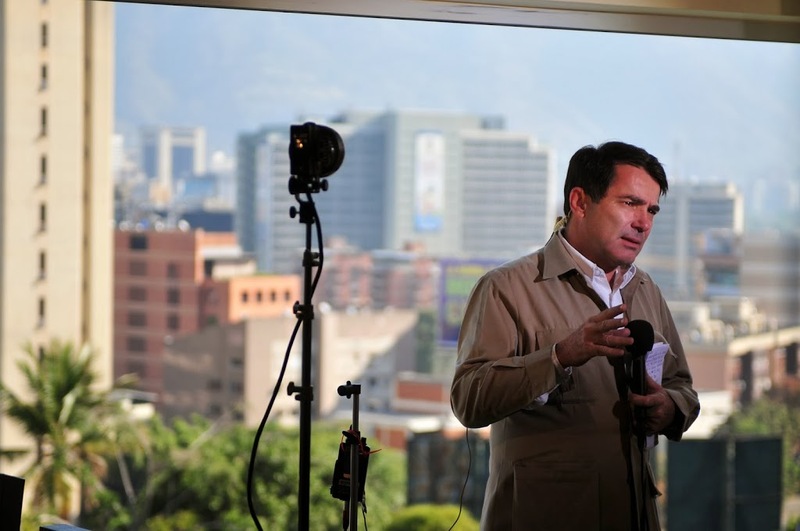 A replacement satellite, known as Satmex 7 / Eutelsat 115B will soon be launched! Using H.264 encoding and DVB-S2 8PSK at very low error correction (FEC) rates of 8/9 allowed us to transmit a HD picture of the same quality typically done in 6 MHz. By measuring the link margins at the receive side we were able to determine we could successfully use the 8/9 FEC to achieve the same quality in larger bandwidth, with a still-acceptable link margin. 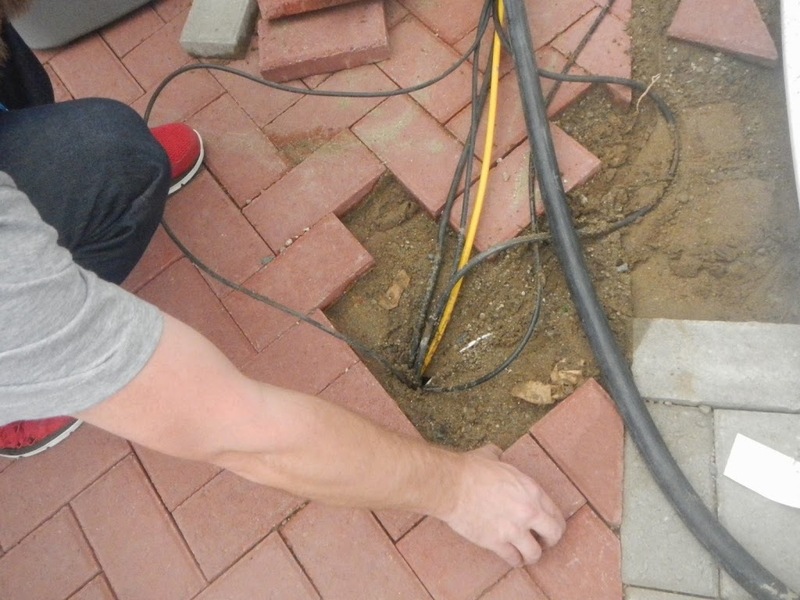 Setting up was probably the most challenging part of this job, requiring a fiber cable to the cameras that went through two conduits and almost got cemented in place! The setup took an entire day before we were ready to do liveshots. 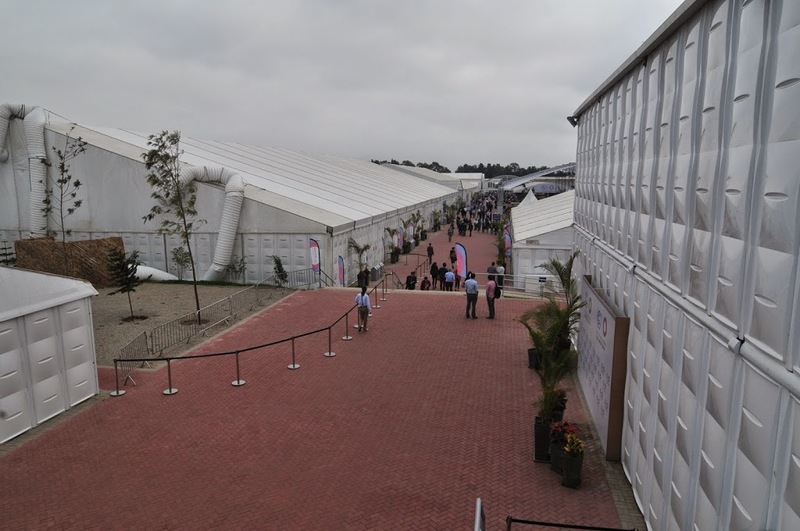 The conference was held on the grounds of a military base known as “El Pentagonito” (The Small Pentagon) and made up of a compound of large temporary buildings. The event went smoothly, except for the bus rides from our hotel to the venue, which sometimes took over 90 minutes due to the traffic in Lima. 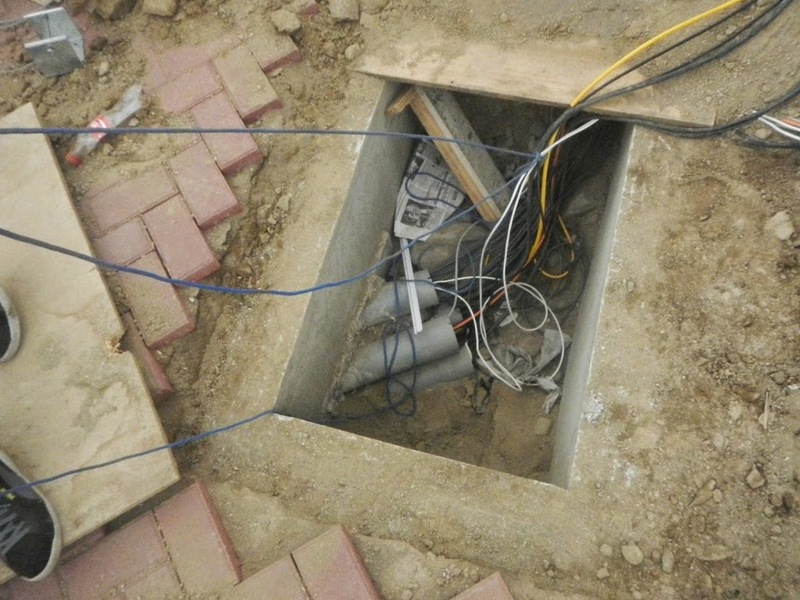 The breakdown was fun, as we had discovered our cables has been squeezed between two sheets of plywood over one of the conduit vaults and had an interlocking brick walkway installed over it. There was not enough room for the fiber cable head to be extracted through the small space they left, so we improvised and used a screwdriver to break a hole in the plywood and remove the cabling. Last week, DCI teamed up again with BoxLine Box medical media to bring high quality live surgery to the annual meeting of the AAGL, held in Vancouver, Canada. 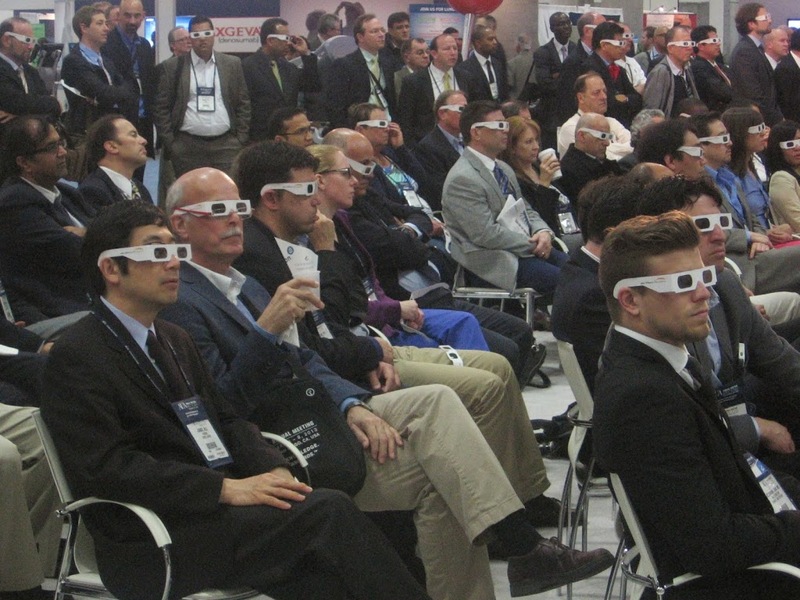 While much smaller than the AUA event where we coordinate more than a dozen live surgeries, the AAGL event had its own challenges. 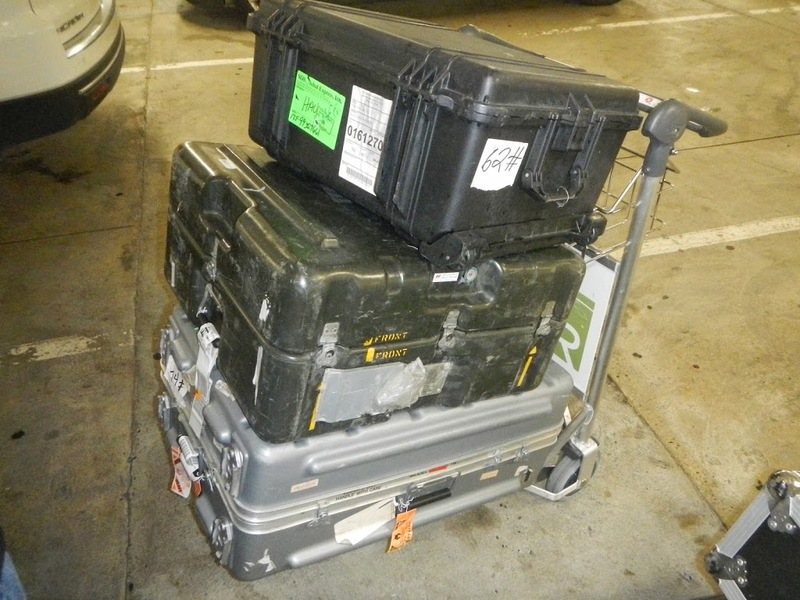 The entire receive-only flyaway, consisting of the 1.1m dish, two IRDs, spectrum monitor, handheld SDI generator and monitor, and a utility case of cables takes up only 3 cases, easily checkable on any airline. The convention center told us “no has been successful getting satellite” to work reliably at the convention center, and they blamed it on radar from the nearby airport. They suggested downlinking it at a Bell Canada facility in Toronto and fibering it across Canada. 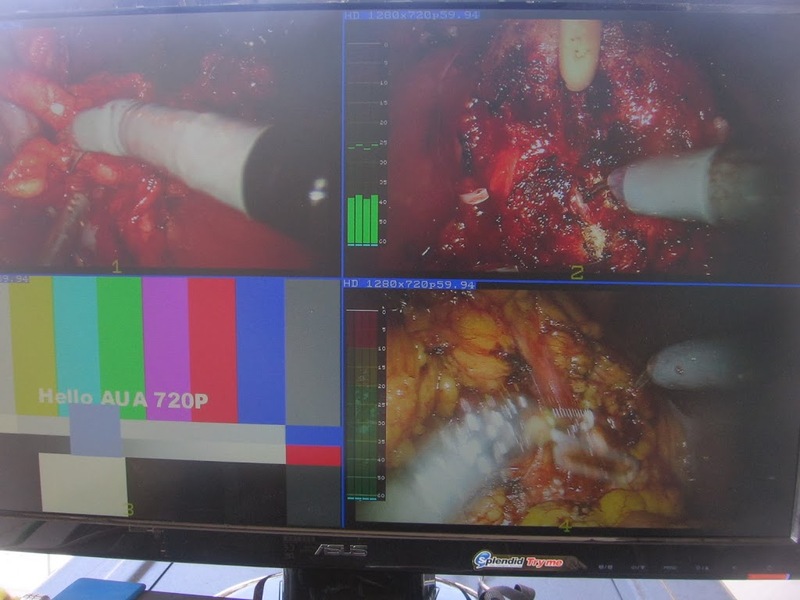 This approach would take the quality control of the feeds out of our hands, something that has made our live surgery broadcasts the highest quality and most reliable in the industry. 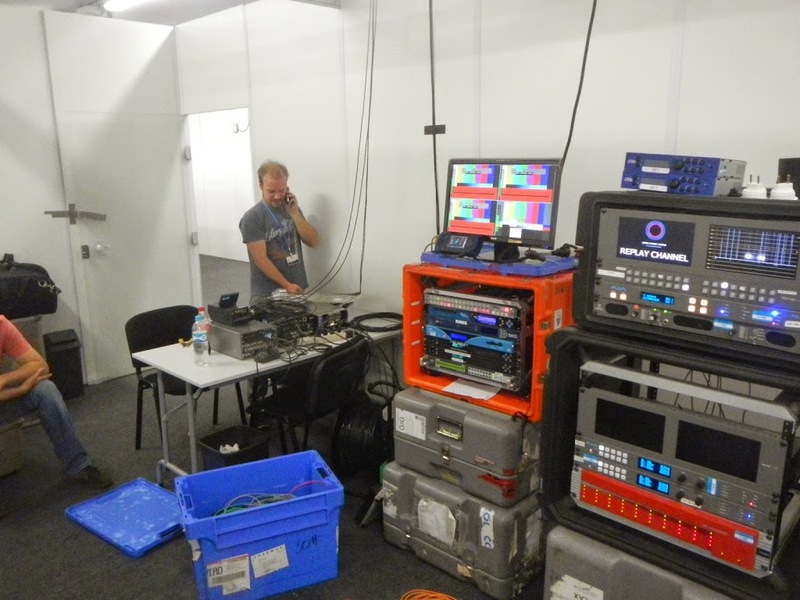 During these conferences, DCI hires the local uplink trucks at each hospital, and provides quality control of encoding and RF parameters, coordinating with the uplinks to make adjustments as necessary to get the best balance of quality and margin. We came equipped with a 1.1m Ku flyaway and a expectation of having to make adjustments. 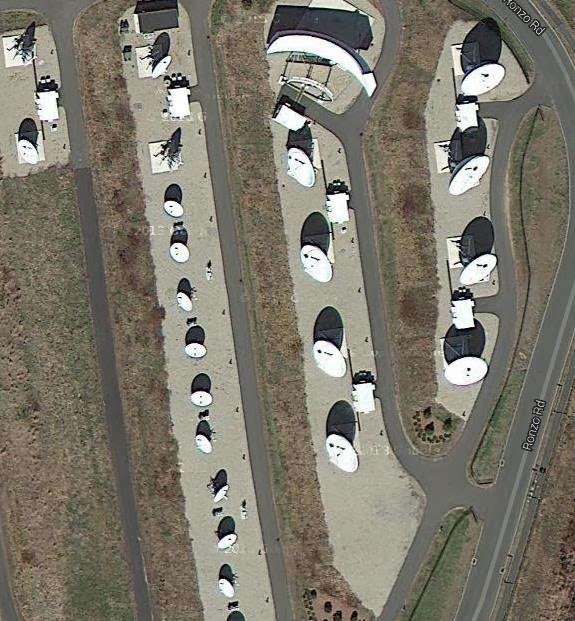 One of the biggest issues we had was with a smaller downlink dish and a high latitude location that made the satellites “stack” up on each other, and with the wide beamwidth of a 1.1m dish, we were getting a lot of adjacent satellite interference. This could explain the trouble others have had at this location. The portable spectrum analyzers we use don’t have enough resolution bandwidth to really peak the adjacent satellite out, so we improvised by using the real-time margin graph on our Ateme IRDs to peak the signal for maximum C/N margin, regardless of what the spectrum looked like. Its similar to how analog shots were peaked up years ago, by using a real-time signal strength meter on the receiver. Our originally planned parameters of 8PSK 2/3 had insufficient margin, so dropping down to QPSK 3/4 gave us margins of around 4dB. We planned for this and reserved more satellite bandwidth than we would use when downlinking in our 2.4m “HD1” satellite truck. 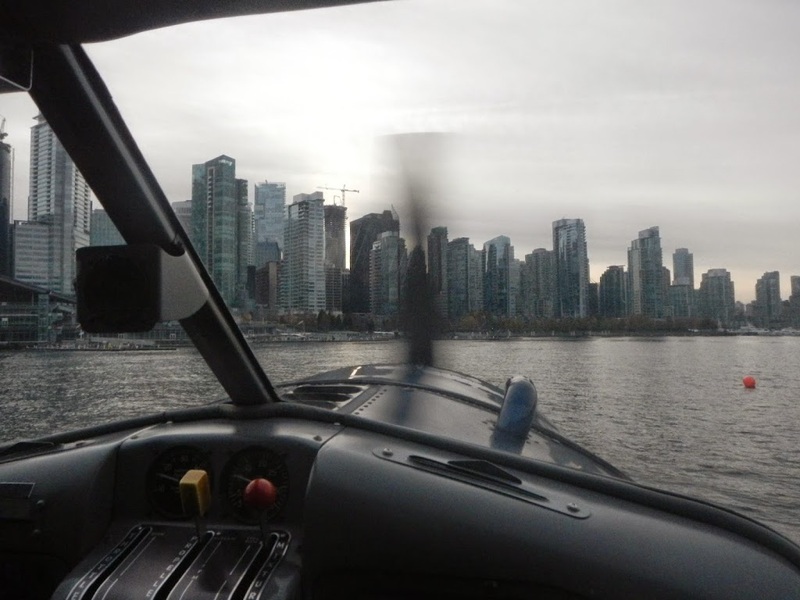 Our dish was set up directly above the Vancouver seaplane airport, one of the only seaplane bases in the world with a control tower. 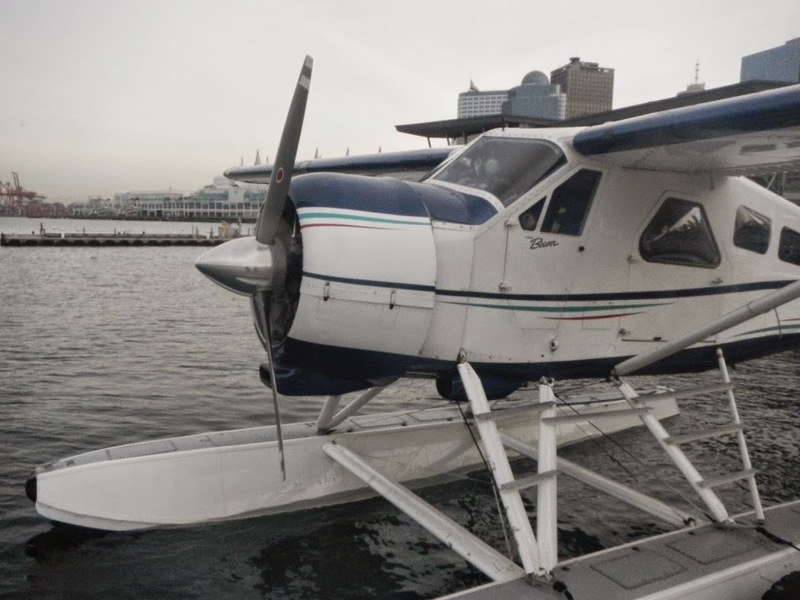 This base serves dozens of scheduled flights to the islands in everything from vintage deHavilland Beavers to large twin turboprop float planes. We even had time to take a quick tour in one of the 1964 deHavilland. After the second live surgery was done, we packed up and headed to the airport, another flawless live surgery events in the books. If you are interested in how DCI can bring this high level of transmission quality control and management of your corporate events, contact us. If you need to produce a live event or recording of a live surgery in the unique setting of a working operating room, contact BoxLine Box. 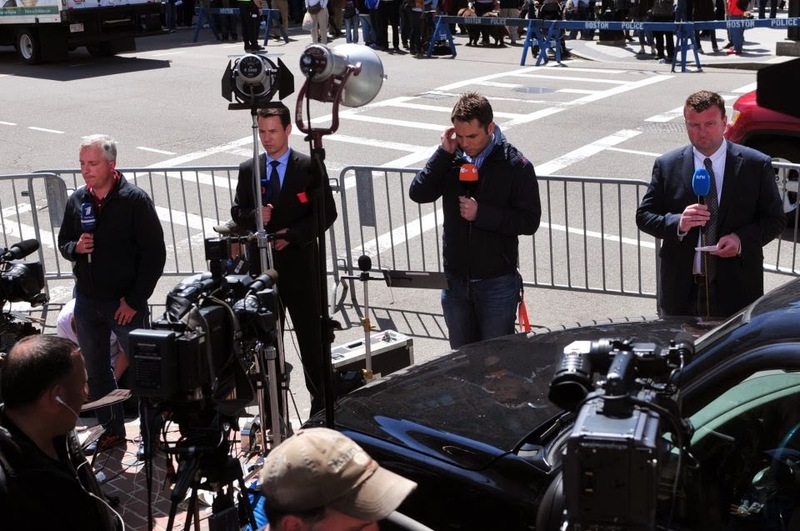 Whenever Hollywood portrays live TV reporters, they one thing they always get wrong is there is never a cable going between the camera and truck. A typical SNG cable reel is between 250-400 feet long, weighs 30-60 pounds. 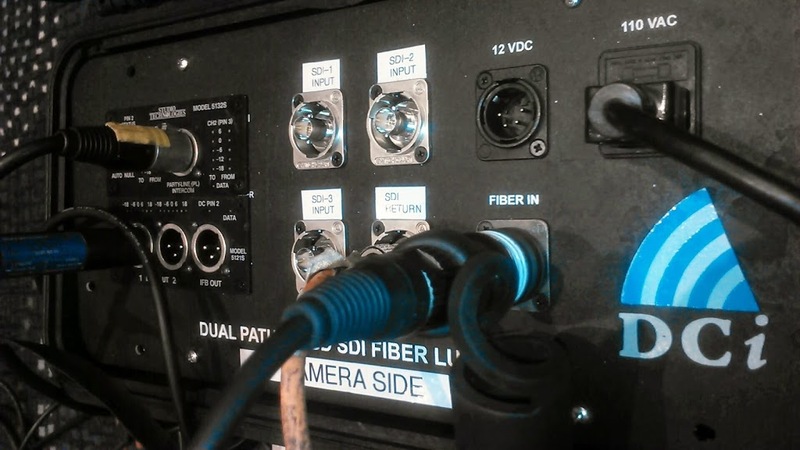 It usually carries one or two video lines, plus several audio cables which in the past were used for microphones along with communications (IFB and Intercom), but now with digital SDI video and embedded audio, they are mainly just used for the comms. A little bit more than a typical SNG reel! Within the past few years, heavy-duty tactical fiber optical cable has become popular, but that is another post! Whenever a satellite truck is set up for a live shot, these cables have to be strung to the camera. 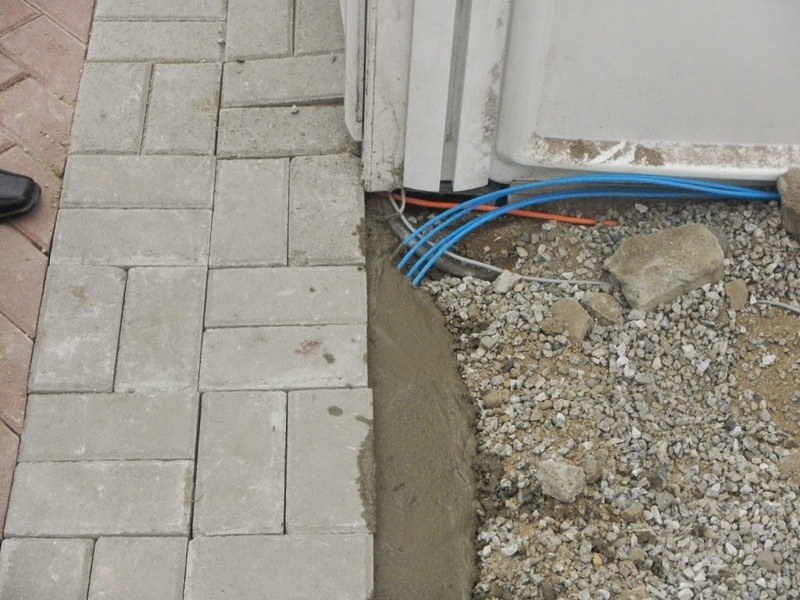 Sometimes it is simply just a few feet from the truck, other times the cable has to be run through a building, requiring an hour or more of hard work. People often ask why it can’t be wireless… after all they can stream video reliably over mobile phones, use WiFi, and a host of other wireless data services. 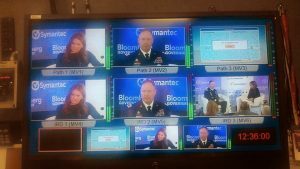 The main answer is unlike IP based streaming, which may have at least 30 seconds of delay built-in for error correction, wireless for live reporting has to be very low delay, otherwise the lag between reporter and anchor during talk-backs is very noticeable. Also since it will be encoded again, very high bitrates are required. 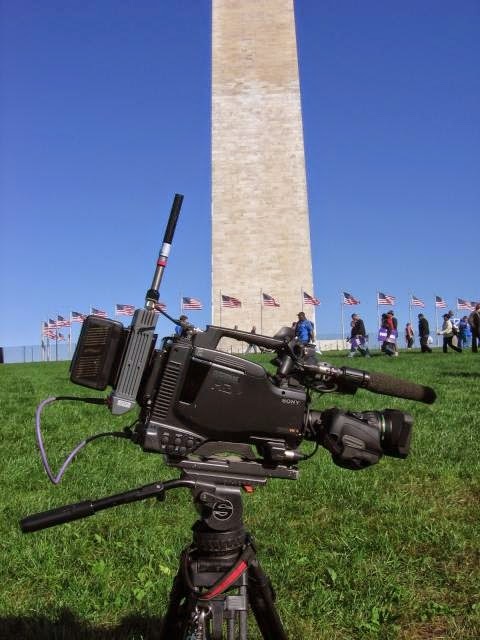 DCI is proud to be the only SNG company in the Washington area to own our camera-back microwave system, and one of the few SNG companies in the entire country to have a licensed microwave system of any kind. Other systems use the crowded public WiFi bands of 5.4 or 2.4 GHz, but our system operates in a licensed band at 6.4 GHz, allowing better range resulting from less interference. 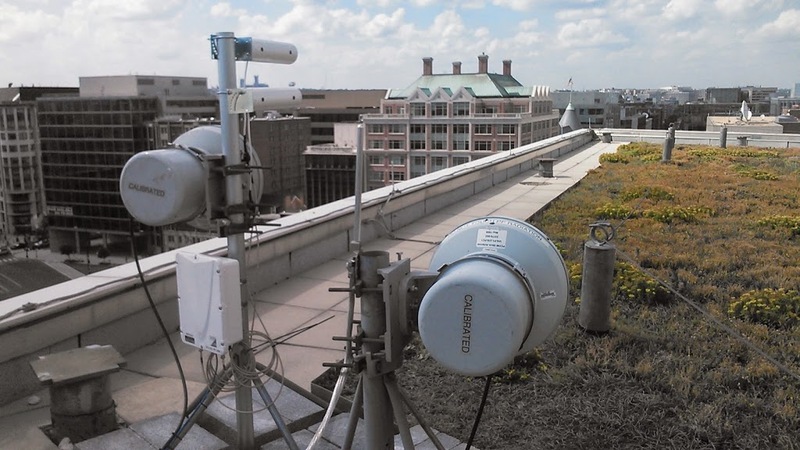 This is the same system we deployed as a fixed-position link every July 4th, but its most versatile when connected to the back of a roaming camera. 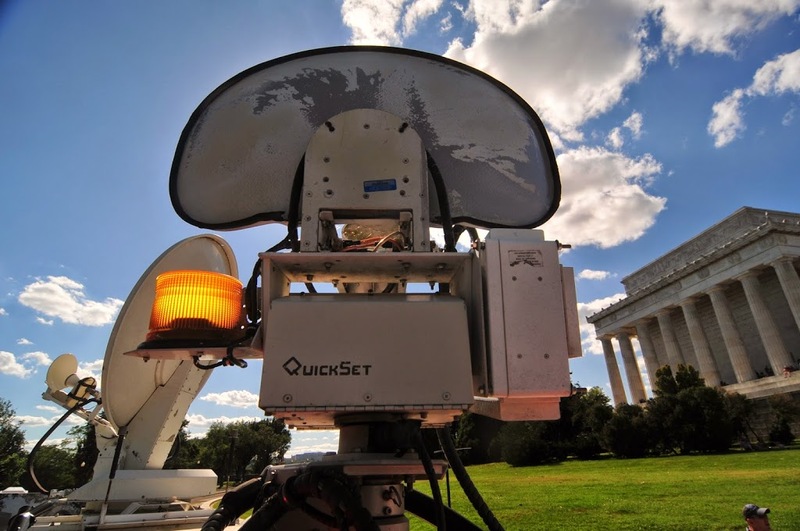 This camera-back system is extremely useful when needing to cover an event where cabling is not possible, such as in Lafayette Park in front of the White House. The only place to park a SNG truck is across a busy road, so covering protests inside the park require a wireless link like DCI’s Campack system, or for crews without a wireless kit, going live from across the street, a far less appealing location. 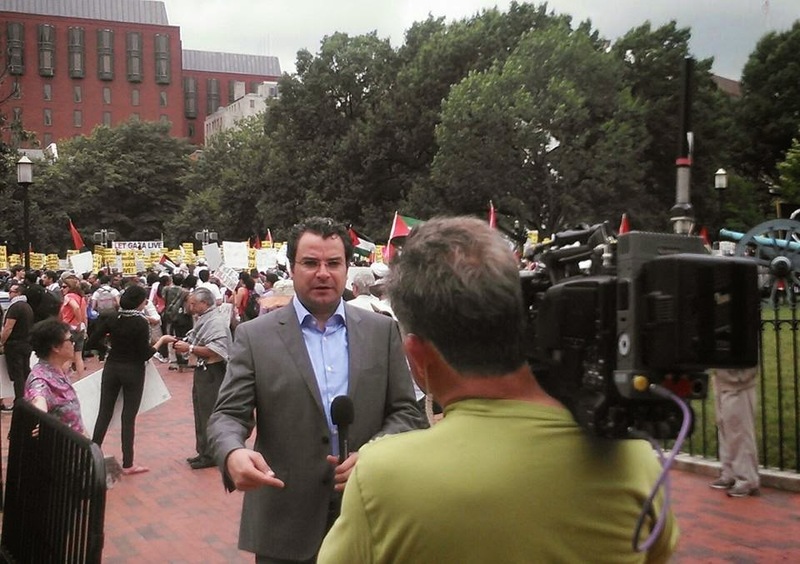 Another use is when covering another popular Washington news event, a march to the Capitol. By placing the truck at a central location and using directional antennas, we can have a mobile reporter go live while covering one of these marches. 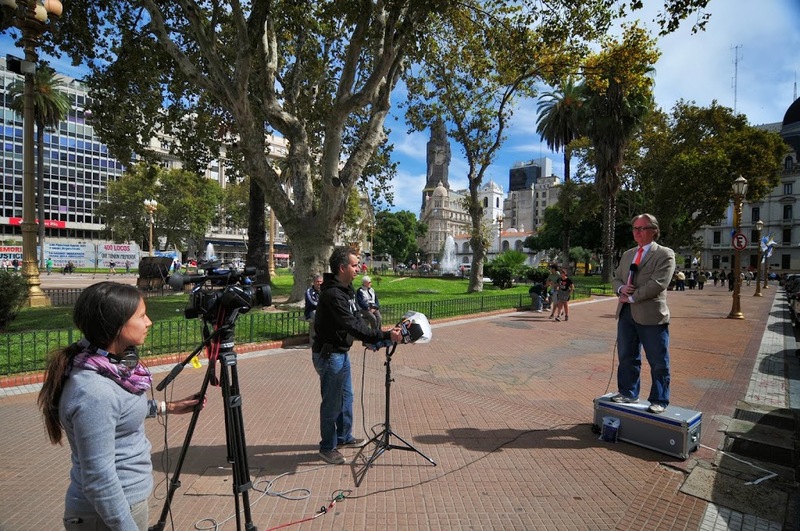 Paired with a simple UHF wireless IFB system for reporter and camera, the camera-back transmitter gives DCI a unique edge when challenging live shots solutions are required. 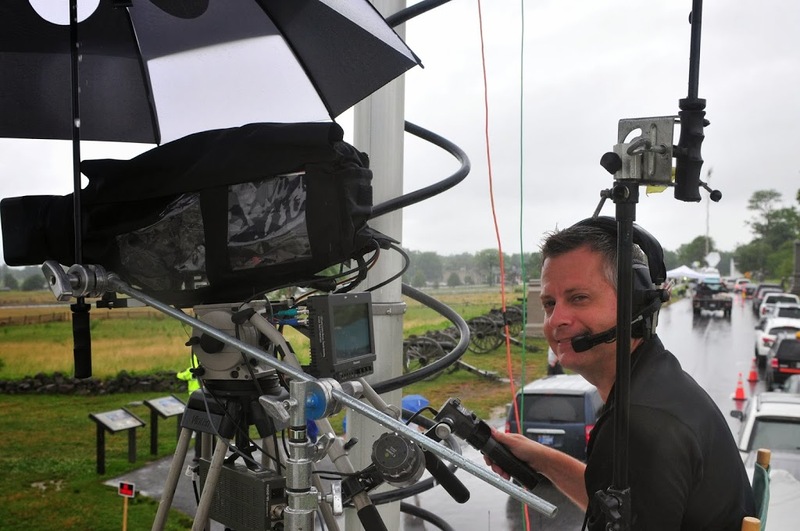 Contact DCI to see how we can put our wireless systems to use for your next broadcast. 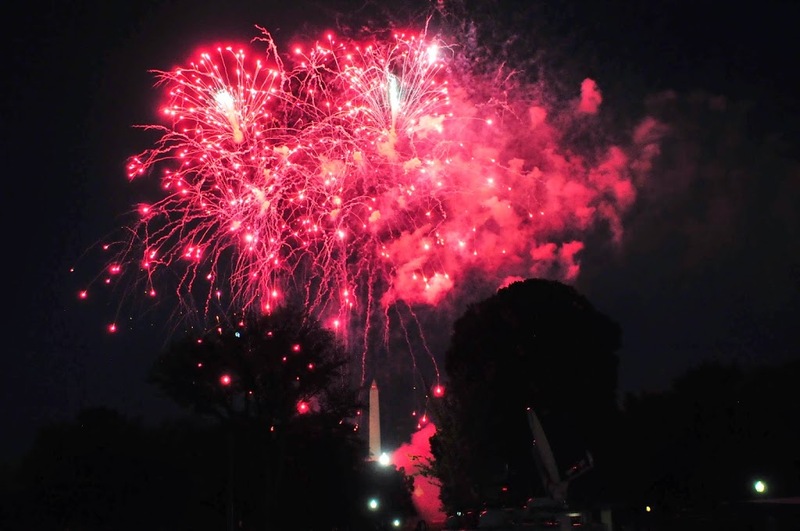 The famous PBS fireworks camera with a perfect view of the DC memorials. 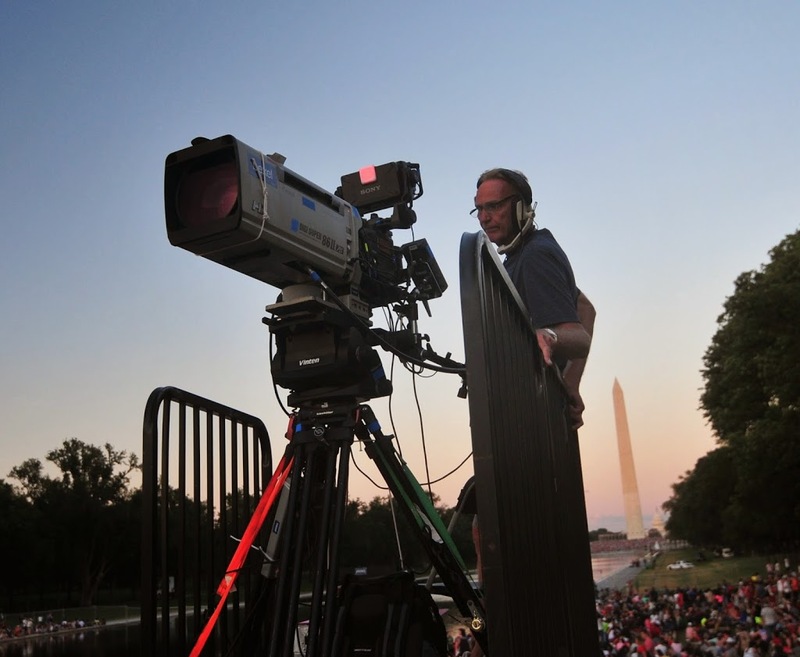 DCI has been helping link up remote cameras for the PBS “A Capitol Fourth” concert show for more than 15 years. What had once been a single SD analog microwave path has become two high quality HD feeds. This year, with the loss of the Clocktower receive site to a hotel development project, we had to think of another way to send the cameras back to the production truck. The first of two cameras was stationed at the Lincoln Memorial. 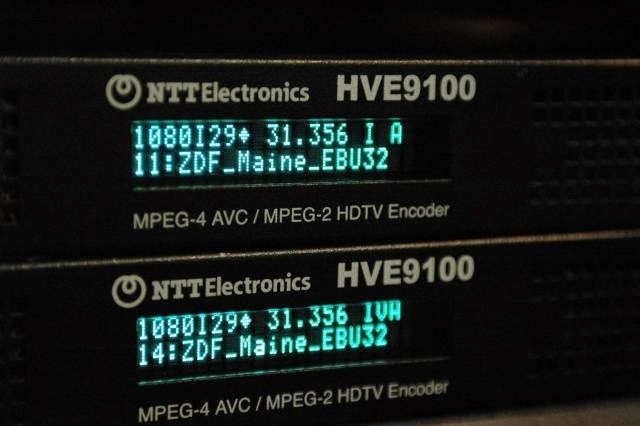 We used our normal 7GHz NuComm HD microwave transmitter in the van, but instead of it’s internal MPEG-2 encoder, we encoded externally to take advantage of H.264 4:2:2 encoding for a better quality picture. We took the ASI output of the encoder into the microwave transmitter running at 17mbps. 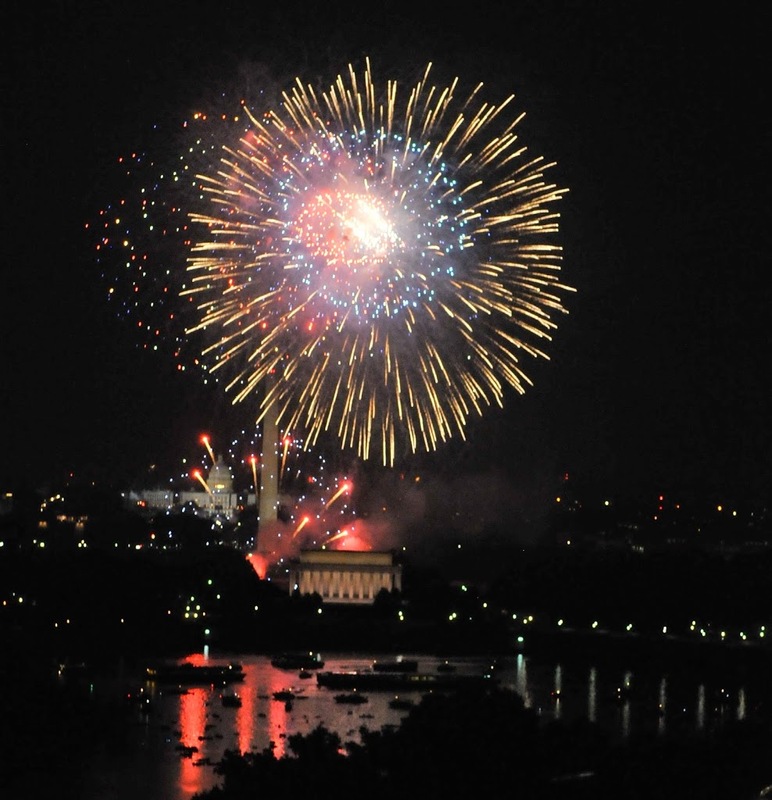 The second camera was located on a balcony of condo in Arlington and sends the famous shot of the memorials with fireworks above. 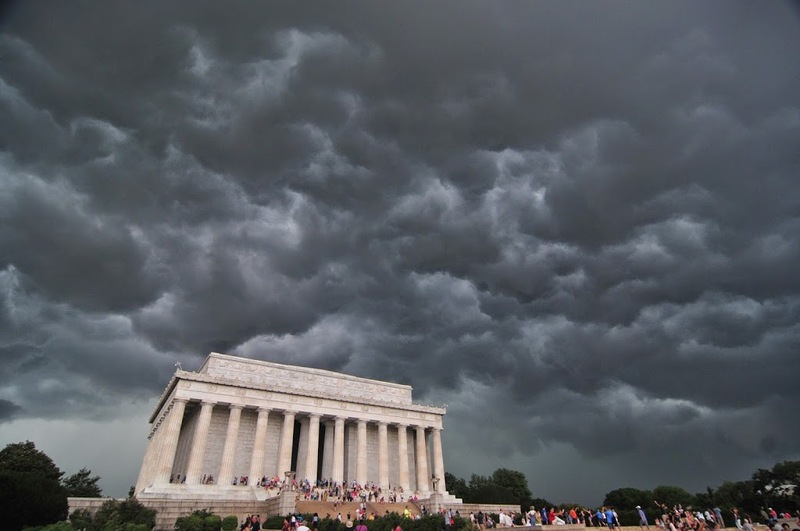 A NuComm receiver at that location received the Lincoln Memorial shot and outputted the compressed ASI directly into an ASI mux. Also feeding the mux was a second H.264 4:2:2 encoder with the memorials shot. We also downlinked the program feed off satellite to give return monitoring to the Lincoln camera operator. 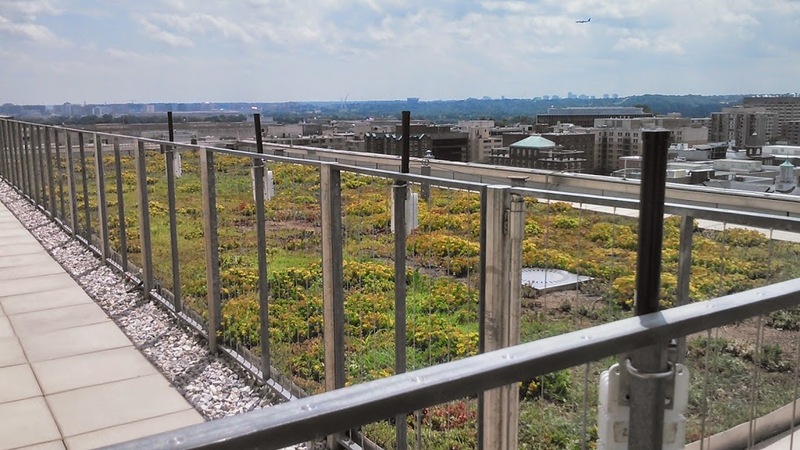 The resulting 34mbps ASI stream contained two services and was fed into a second NuComm transmitter and received at a rooftop in DC where we maintain a redundant 45mbps 38GHz link for a studio. 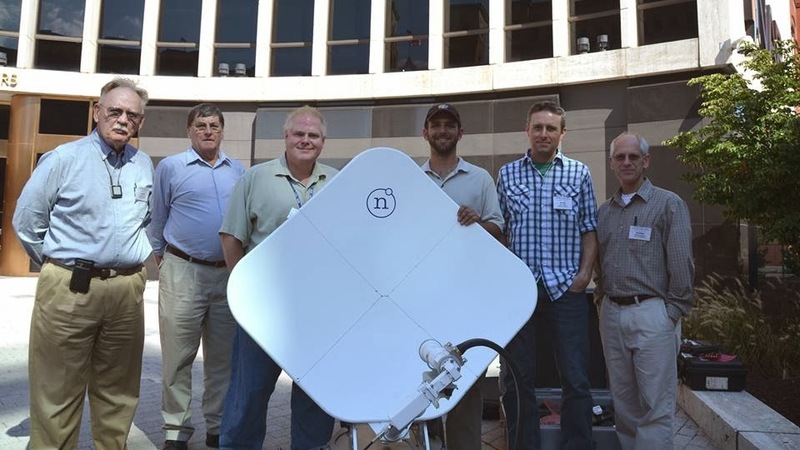 The NuComm receiver fed the multiplexed ASI stream into the 38GHz transmitter where it was received back at DCI, decoded into two HD-SDI streams and sent over Verizon fiber to the production truck on Capitol Hill. 45 mbps 38 GHz links, along with a long-range WiFi bridge connecting our DCI LAN to the microwave receiver on the rooftop. Article in AUA convention newspaper after our first 3D live case. 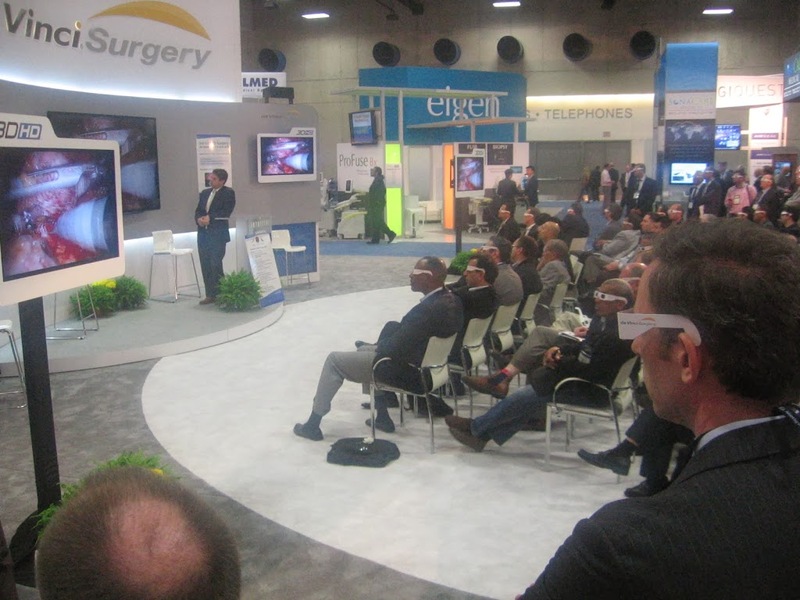 Last year, we worked with BoxLine Box medical communications to transmit the first live 3D surgery broadcast to the American Urological Association convention in San Diego. 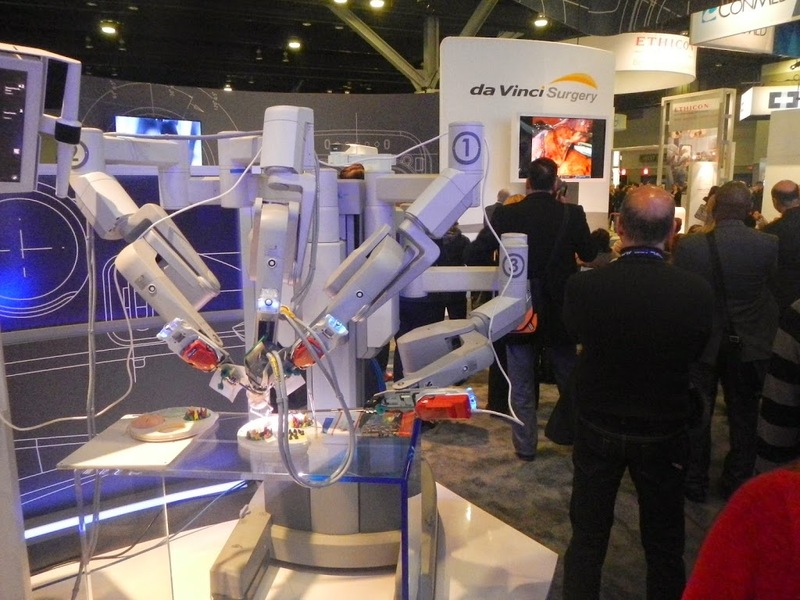 The single case was so popular that we were asked back for the 2014 show in Orlando, but this time instead of one 3D broadcast in a trade show booth for surgical robot maker Intuitive, we were asked to handle ALL of the live transmissions for the convention itself. So instead of room for a few hundred people standing around the Intuitive booth, we would be broadcasting into a 3000-seat auditorium as part of the official AUA program, and there would be multiple broadcasts from several different surgical instruments, each of which presented a different “flavor” of video for us to handle. DCI truck at Orlando Convention Center for reception of live surgery feeds. The much larger broadcast required a different approach to transmission. 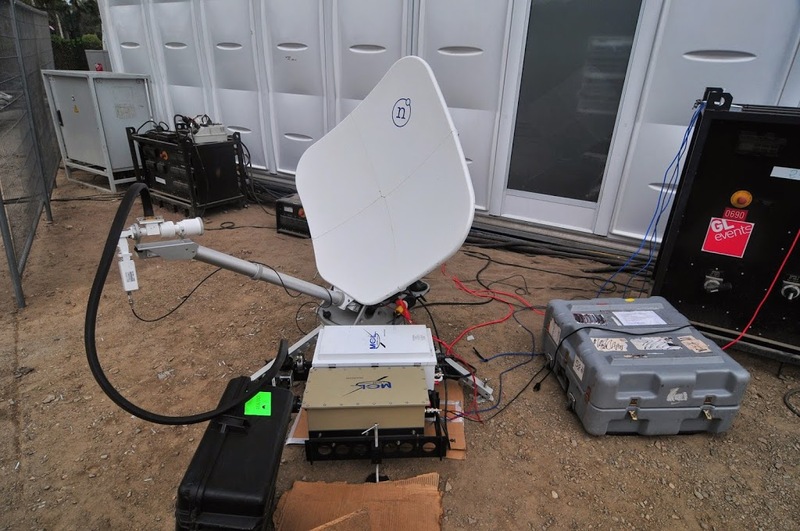 Last year we transmitted each “eye” individually, and combined into a 3D signal at the receive site, which required specialized equipment to adjust timing differences. With multiple 3D broadcasts to receive, that was not practical this year. After some testing, we found we could combine the two signals prior to uplink, which simplified the receive side setup. 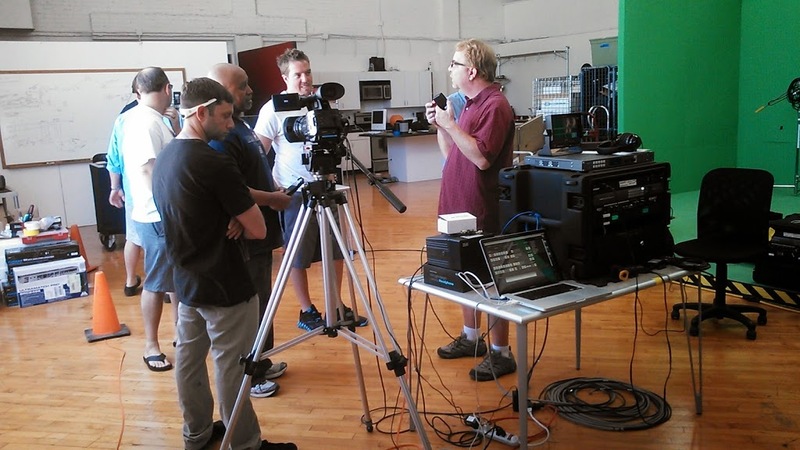 3D setup training with Mike Evans at the Boxline Box studios in San Diego a few weeks before the AUA 2014 convention in Orlando. Each site had a Boxline Box production crew responsible for interfacing between the operating room and the satellite truck. Also unlike last year we had to deal with three different flavors of SMPTE 424M 3gbps video- the DaVinci robot outputs “dual link” HD-SDI, which is two separate 1.5gbps outputs, one for each eye. We also had to use 3G “Level A” from a Karl Storz Endoscope, which is a true 3gbps signal for 1080p video. The third format we were presented with was “Level B” from an Olympus device, which is similar to “dual link”, but the two interlaced signals are carried on one cable. Since all of the 3gbps SDI signals are incompatible with most MPEG encoders, we had to down convert to 1.5gbps SDI for transmission. In the auditorium the 3D presentations used a special drop-in video screen and dual projectors run through polarizing filters which allowed stereoscopic viewing with passive 3D glasses. Eden Roc hotel at Miami Beach. 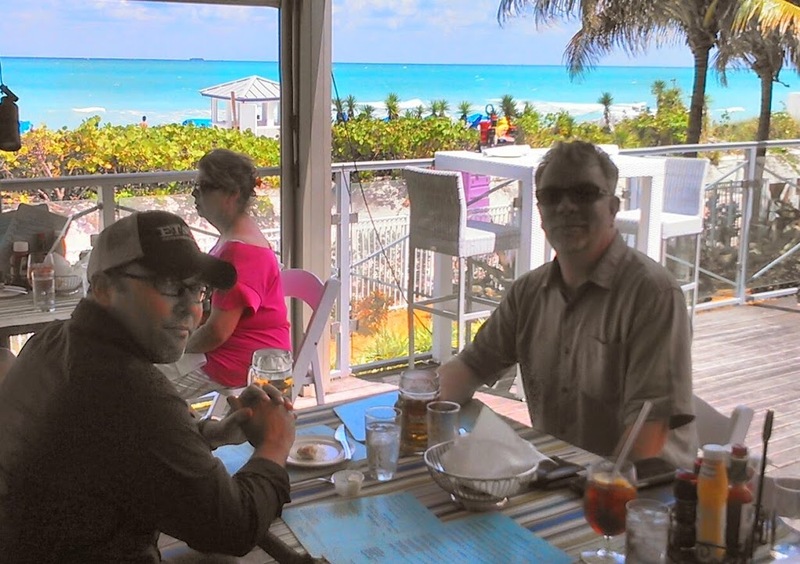 Our Miami production team after a site survey in Miami Beach. Above- DCI’s old 1.2m flyaway brought back in service to receive the feeds from our truck. 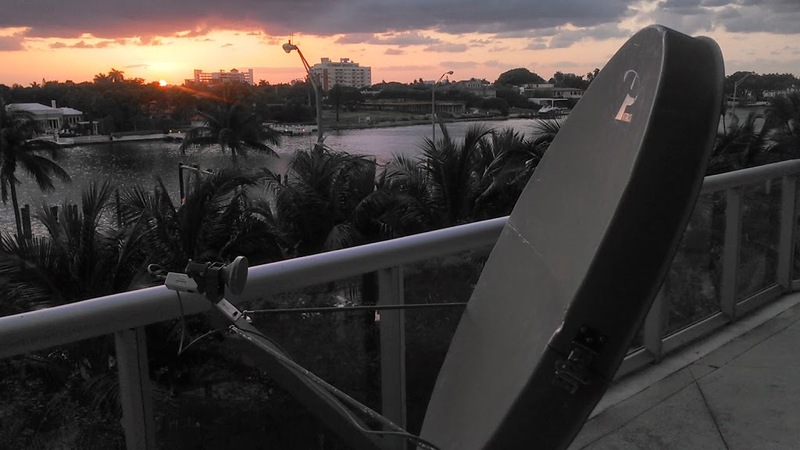 We used our old 1.2m Patriot flyaway to receive the broadcast at the Eden Roc. 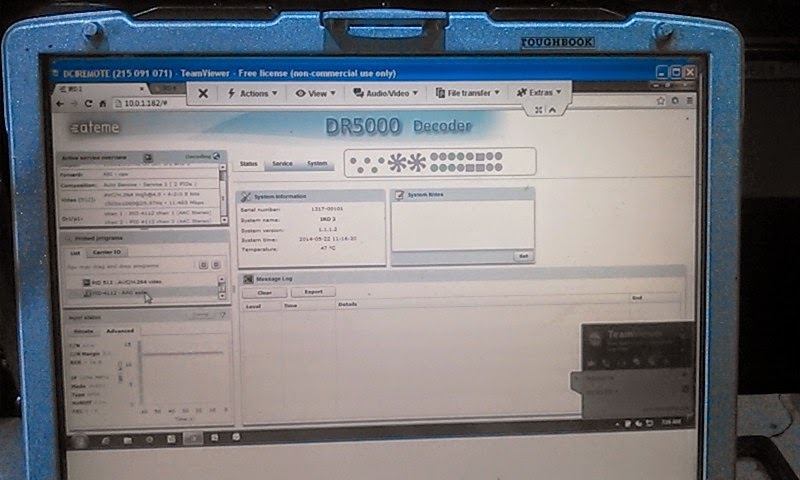 Two IRDs connected to a laptop running Team Viewer software and an internet connection from the hotel allowed us to remotely monitor the signal status on the main and backup IRD from the transmit truck 10 miles away and make power adjustments as necessary. Remote Control of the receive site flyaway. 3D live transmission has found a niche market with medical distance education, and DCI and Boxline Box are the established leaders in providing this kind of transmission at the highest quality possible. Second generation (left) and first generation (right) airline-checkable flyaways. DCI’s first-generation airline-checkable flyaway is a Patriot 1.1m aluminum 6-segment military “manpack” antenna. This flyaway has worked well, however we wanted to build something more rugged and self-contained. The result is our second-generationairline flyaway, a modified Norsat SecureLink. We stripped this system down to just the reflector and base, removing the small 20w BUC, LNA, and other electronics used for Norsat’s IP link. With a carbon fiber reflector rated at 600 watts by manufacture Cobham Defense in the UK, this little flyaway is capable of so much more than the original 10mbps it was first used for. Our modification includes installing TWO high power amplifiers- a a MCL MT3400, and the latest in TWT technology, a 32lb linearized 400w MT2400.– in a custom-made collapsible bracket that both acts as a ballast for the antenna and raises the amplifiers off the ground. Both of these outdoor amplifiers have internal block upconverters (BUCs). Where has the first-generation flyaway traveled? A redundant 4-path H.264 HD flyaway that fits on a baggage cart? Yes, DCI can do that! Its not just the flyaway antenna that is special however. Ten-channel ASI muxes, multiple MPEG 4 HD encoders, DVB-S2 modulators- all redundant, allow the flyaway to transmit more data in less bandwidth than ever before possible. For example, in a 18MHz slot using 8PSK, we can easily carry eight paths of SD and HD in H.264 Or in a typical 6MHz slot, we can do two SD or one high-quality HD in MPEG-4. With the combination of DVB-S2’s increase in throughput and MPEG-4 increase in efficiency, space segment costs are lower and easier to book. We also carry a small 16×16 HD/SD router, a Phabrix HD/SD analyzer, compact SDI quad viewer, and all the assorted cables, tools, and spare parts needed for successful self-contained transmission from anywhere in the world. As the oldest flyaway operator in continuous operation in the US, DCI has a long history of innovation in the field. Our first flyaway, a 1.8m Advent Mantis, provided the Department of Defense pool during Desert Storm from Kuwait City, a flyaway voice comms system decades before commercial equipment was available, covering the Japanese embassy hostage crisis in Peru, and the list goes on. DCI designed and built this comms system totally in house, allowing our first flyaway to carry phone calls along with the video uplink. This was decades before comms systems became commercially available. 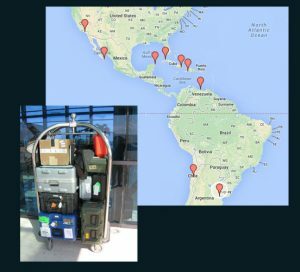 DCI’s current flyaway systems continue the tradition providing innovative solutions in difficult locations such as the Haiti earthquake, Chile mine rescue, and Papal visit to Cuba. 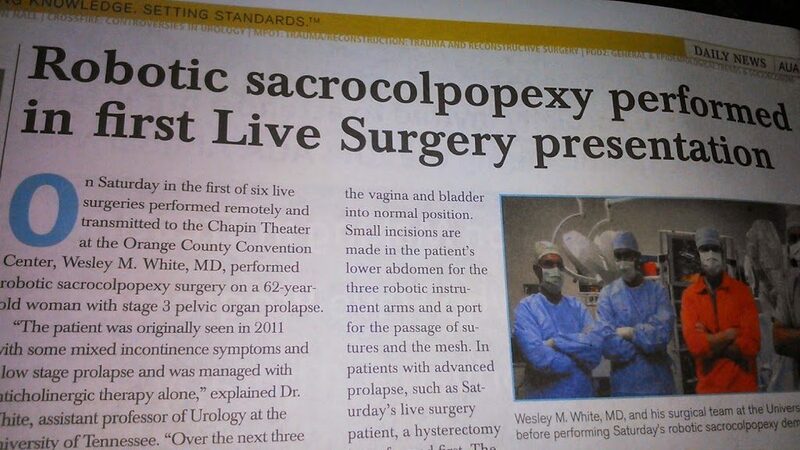 Our flyaway recently downlinked the first ever live surgery 3D broadcast! The small airline checkable footprint makes covering breaking news events like the Chavez funeral in Caracas, or the new pope from Buenos Aires in a way never before possible, yet still maintaining the full redundancy and capability of a cargo-only flyaway. January- Inauguration parade coverage: DCI has been involved in the inauguration parades since our founding in 1986. 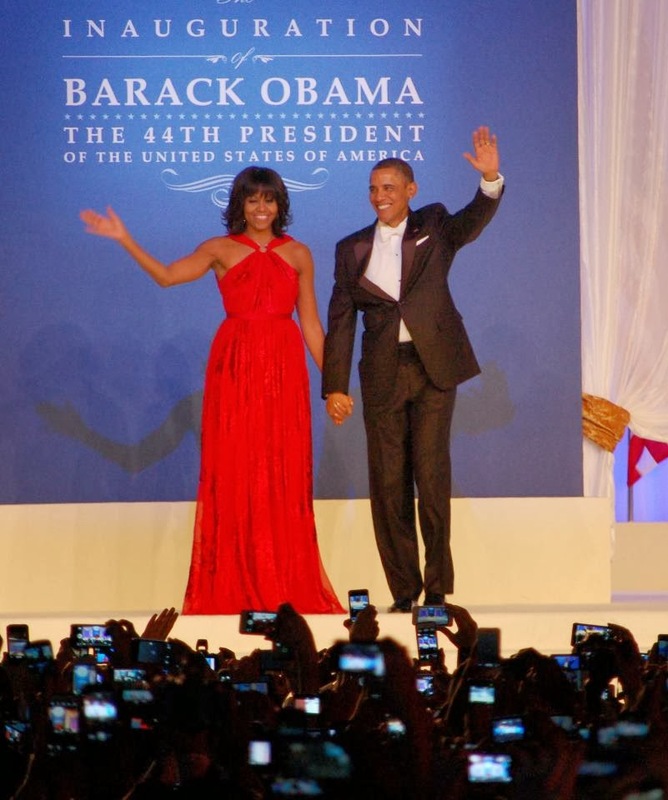 This year we provided a roaming camera and satellite uplink for German network ZDF (who walked the length of the mall twice trying to find the media entrance!). We also had a live shot position in the Inaugural ballroom. 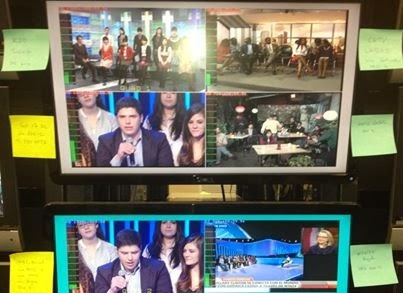 February- Global Town Hall: DCI worked with the State Department to facilitate transmission of Secretary Clinton’s Global Town Hall. Our teleport routed signals for India, Nigeria, Lebanon, Japan, and Colombia. 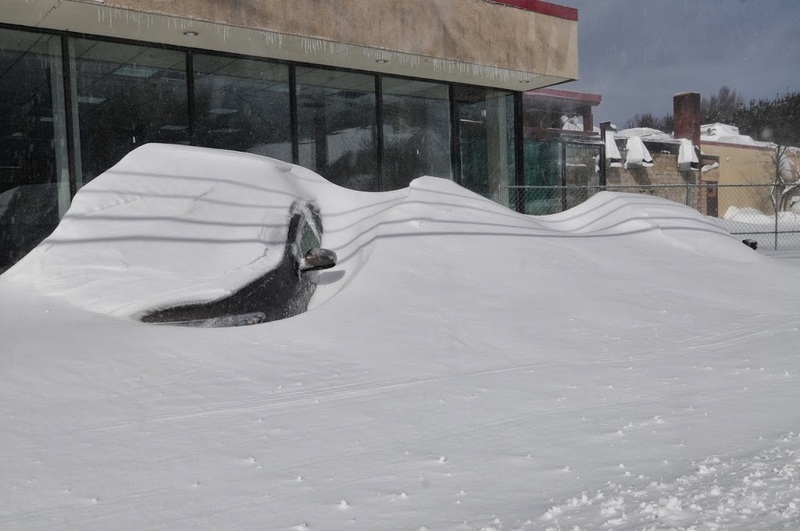 February- Blizzard! 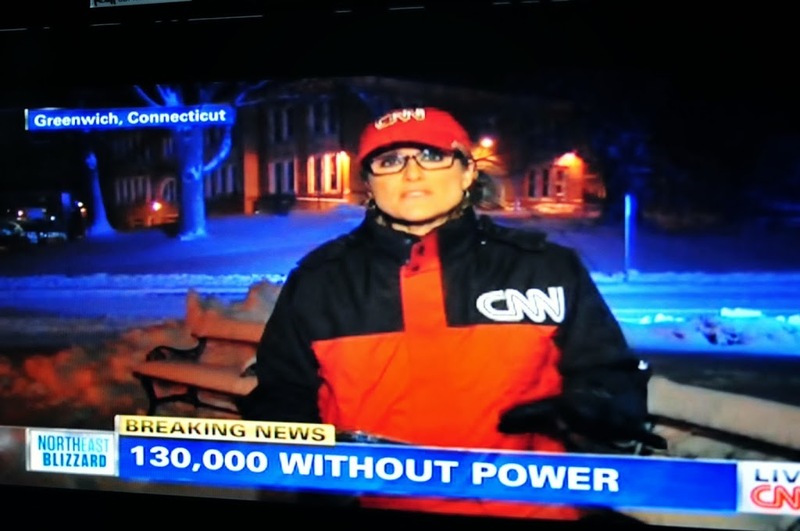 : New England got hit with 30 inches of snow and we were there in Connecticut to get buried under it while working for CNN. 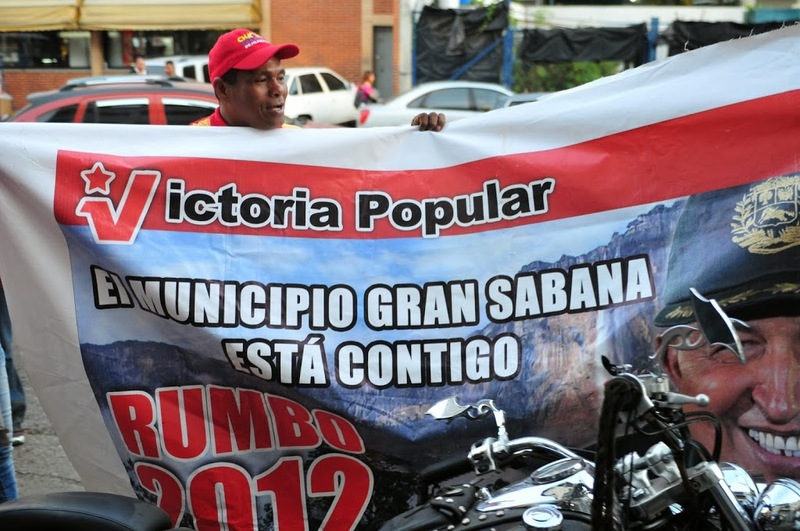 March- Hugo Chavez: When President For Life Hugo Chavez died in March, we were on the ground in Caracas less than 24 hours later for live coverage of his funeral. 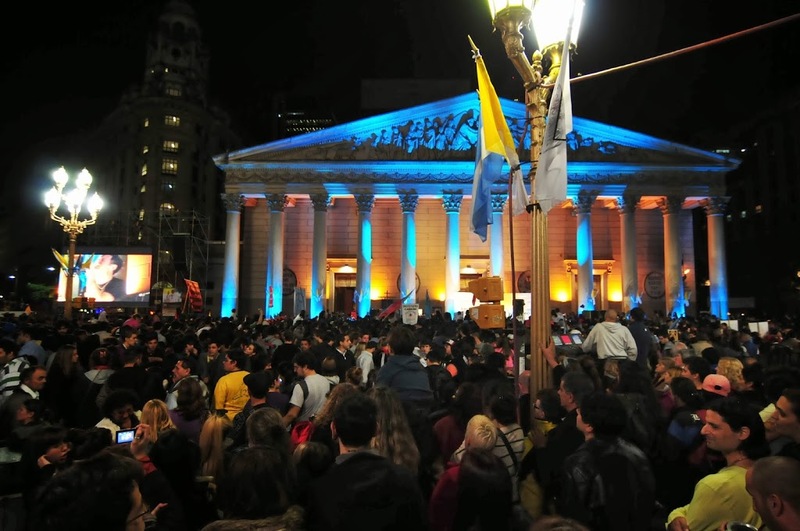 March- Buenos Aires: Less than 2 weeks after returning from Caracas, it was back on the road to cover the surprise election of Argentinian Bishop Jorge Bergoglio to be the next Pope. As a secondary live position behind Rome, our coverage from his hometown allowed plenty of down time to enjoy the cosmopolitan city and their famous Italian-Latin cuisine. On the last night a large street festival was held in front of the church with screens showing local celebrations mixed in with a live feed from Rome of the ceremony, which due to the time difference was around 1AM local time. Not a problem for the locals who prefer to eat dinner at 10PM! 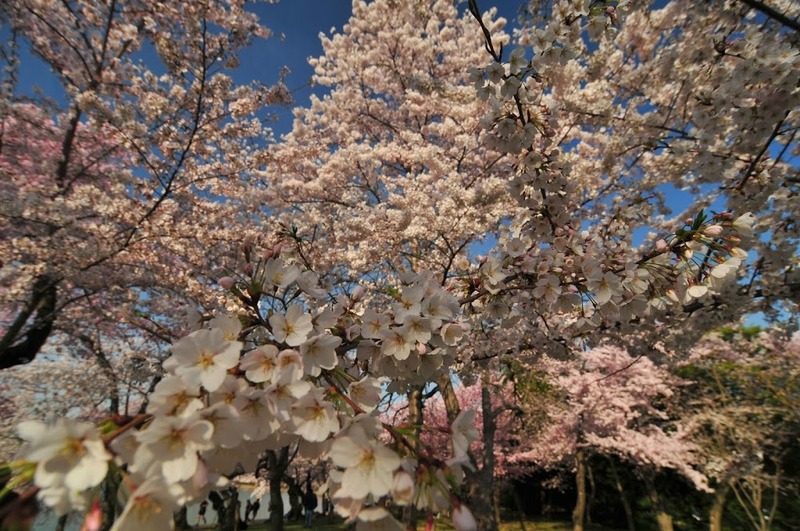 April- Cherry Blossoms: Japanese national broadcaster NHK first did a large 4 camera show at the start of the Cherry Blossom festival, but due to a cold snap the blossoms did not show up on schedule so a smaller operation was done two weeks later in April. 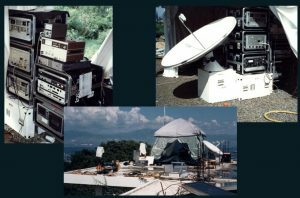 The first shoot involved NHK’s stand-alone switcher pack (complete with camera control units) in the satellite truck, the second was a scaled down portable feed using a small gasoline generator and the COFDM HD microwave link to the Clocktower. 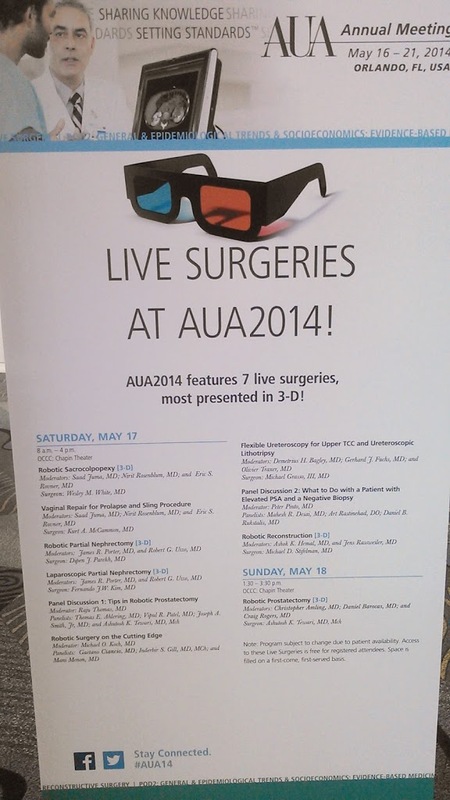 May- Live Surgery in 3D: We were proud to be involved with the first-ever live 3D surgery broadcast at the AUA Conference in San Diego California. 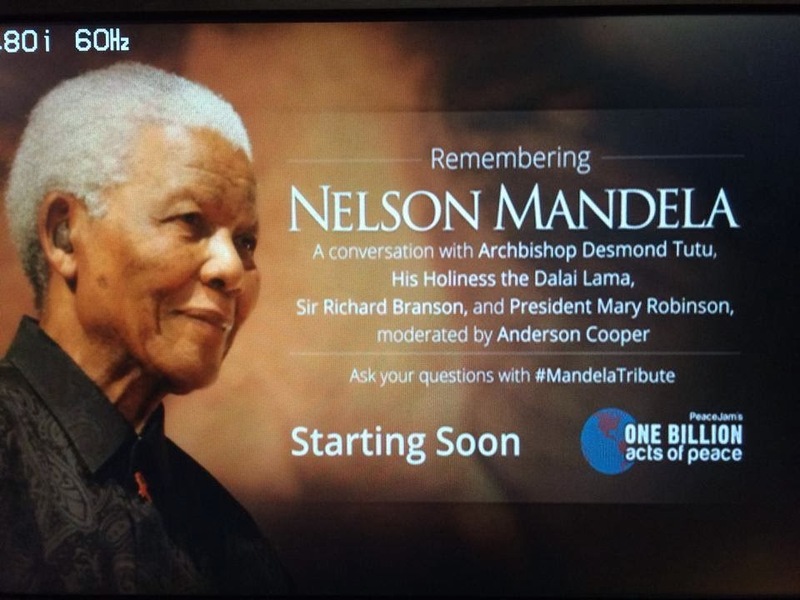 Read more about this milestone broadcast here. 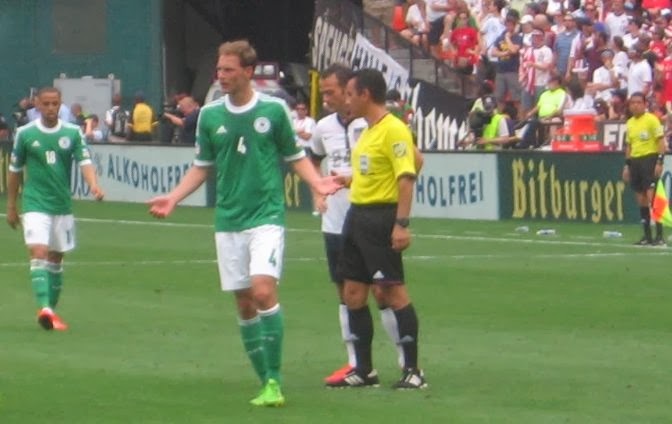 June- US-Germany International Friendly: DCI provided live shots for German broadcasters covering the International Friendly soccer match between the Deutscher fußball-bund (German National Team) and the US National Team. We did live interviews with the coach and players at the team hotel, and the next day outside the stadium in Washington. Our teleport also handled the trans-Atlantic satellite turnarounds. The US team won a surprise 4-3 victory over the Germans, who claimed their best players were at home for the club team championship game. We will see them again in Rio this summer for the World Cup! 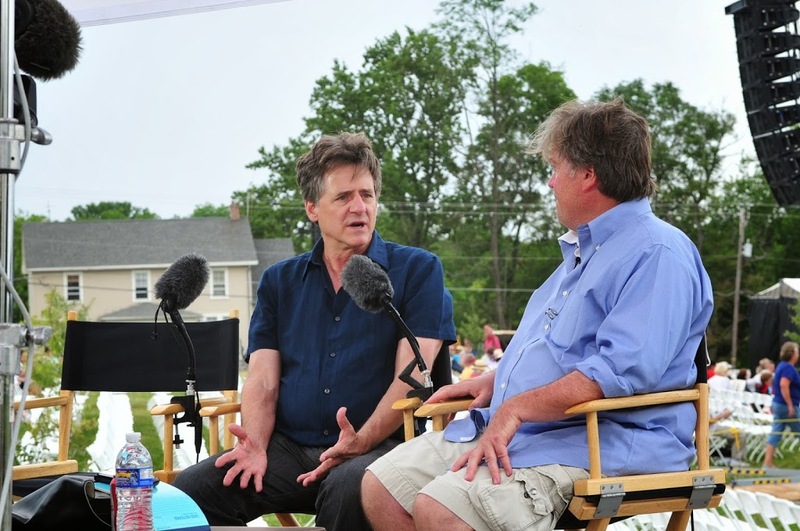 July- 150th Anniversary of the Battle Of Gettysburg: DCI did two complete productions at the battlefield, including multiple cameras, teleprompter, graphics, set design, transmission and webcasting. August- US Treasury: We were inside the White House compound for this live interview with Secretary of the Treasury Jack Lew. 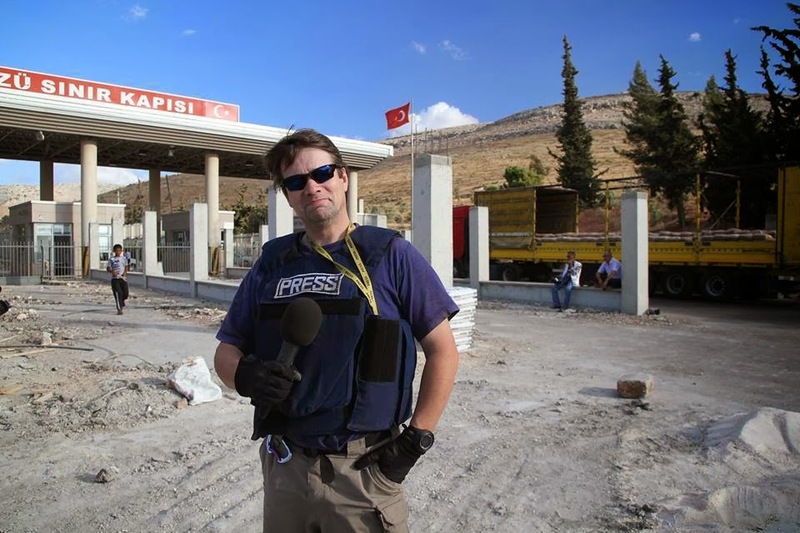 September: Turkey/Syria Border: Many long hours of travel for some quick shooting at the Syria/Turkey border for a Google Hangout with Secretary of State John Kerry. 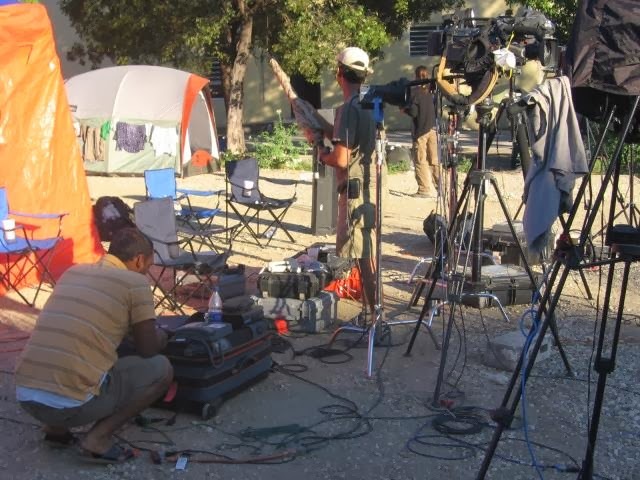 The original plan was to microwave from across the border to a satellite truck on the Turkey side but that was not possible so we settled for feeding from the border crossing, where a truck bomb went off hours before the crew was planned to arrive. October- NAB Training Class: The National Association of Broadcasters holds an Uplink Operator’s Training course every year, and as the oldest operational satellite transmission company in Washington, DCI is often asked to do satellite truck demos for the break-out sessions to show the students a real-world uplink access. This year NBC provided the truck and NAB asked us to demo our new flyaway antenna. The antenna was assembled and disassembled about 6 times in the hot October afternoon for the different groups, a great exercise for its first deployment. November- ESPN Certification: Our HD1 satellite truck traveled to ESPN Headquarters in Bristol, CT to undergo technical qualification for the network. We are now certified to transmit sporting events for ESPN. After the test we were given a tour of this impressive broadcast facility and teleport, which handled over 79,000 feeds in 2012! We are looking forward to another great year! To see how DCI can assist with your video projects or satellite needs, please contact us. 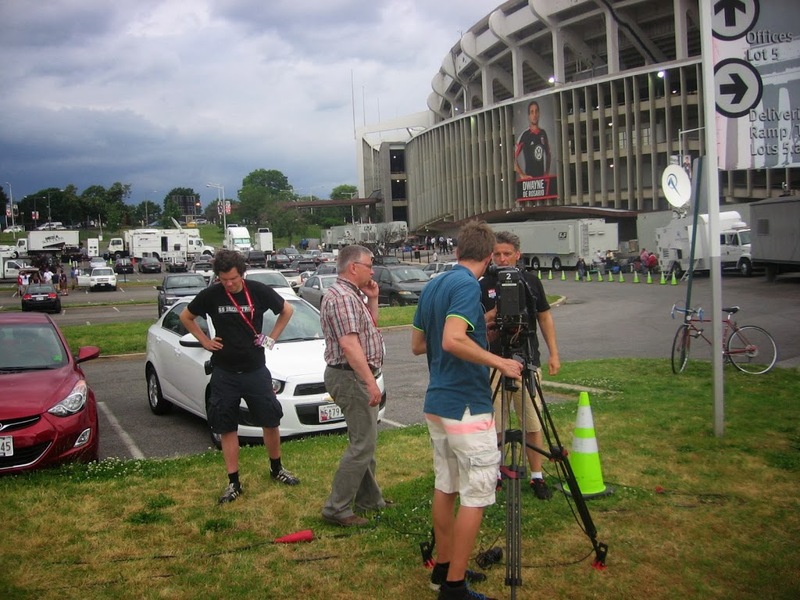 DCI recently branched out into the world of sports transmission when we received ESPN technical qualification during a visit to Bristol, CT with our HD1 satellite truck! While the radio frequency (RF) section is essentially the same, there are a lot of differences between doing news and backhauling sports. 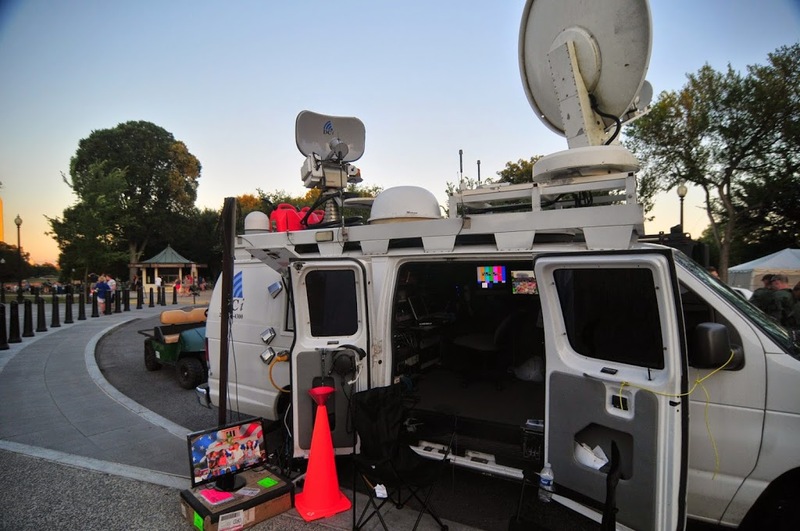 DCI is proud to have a truck that meets both the demands of sports backhaul, as well as major news events. Transmission paths: Covering a large news story for an organization like AP or EBU may require multiple satellite paths, sometimes 5 or more. Multiplexers are commonly used. Most sports broadcasts only require 1 path. 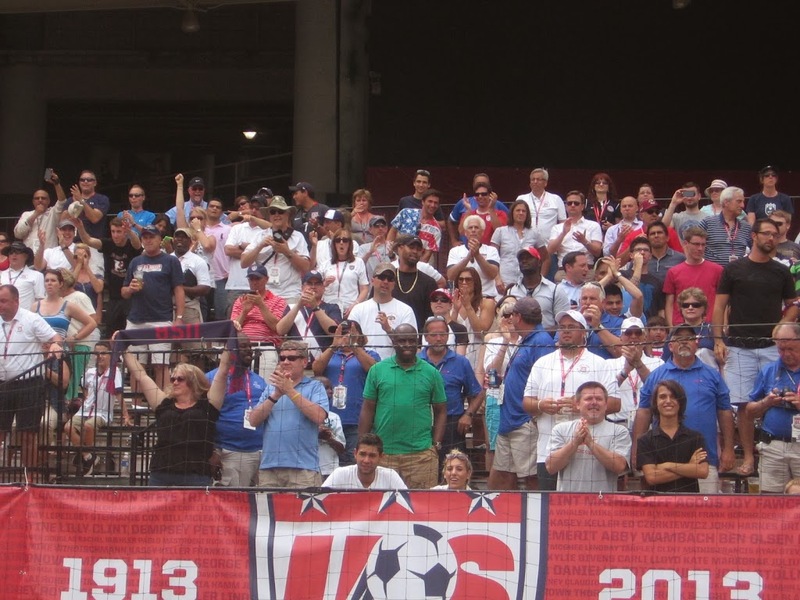 Audio: News is typically 2 channels, sporting events can have up to 16! Chroma: With all the motion in a sporting event, they are often broadcast with higher-quality compression techniques, such as 4:2:2 and 10-bit sampling. Bitrate: Again with lots of motion, high bitrates are a must. 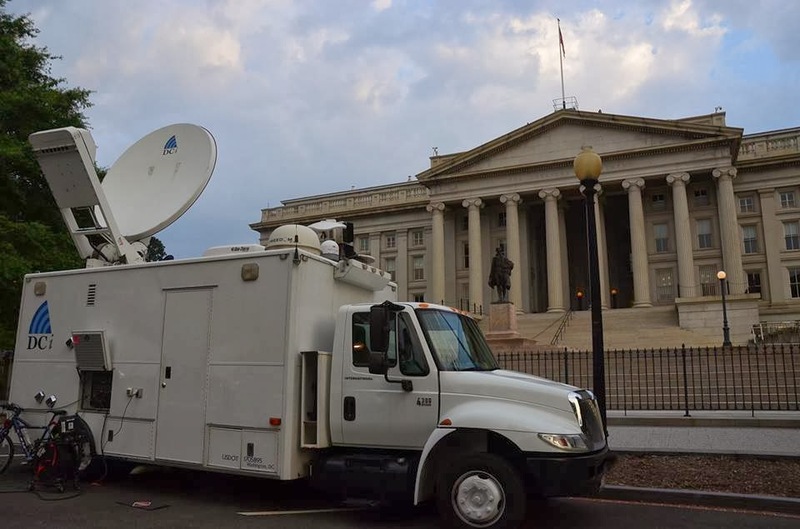 This lends itself to larger transmitters and higher gain antennas that may be impractical for some news events where a compact SNG van may be the only way to park. 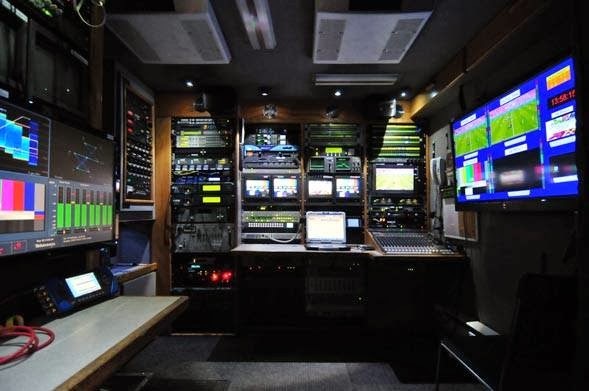 Monitoring: Being able to monitor all 16 channels of audio, and multiple points along the transmission path is a must for trucks wanting to work for the largest sports channels. Simultaneous multi-point monitoring the the quickest way to isolate where a potential problem is. 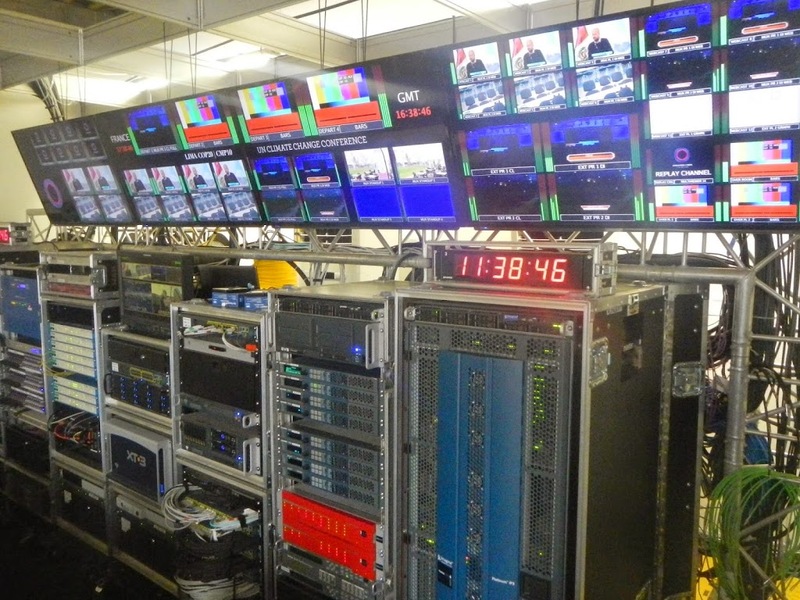 DCI uses a 10-channel Miranda multi-viewer to accomplish this, it can display several video sources on one large monitor. In a sports transmission, it would be used to monitor the primary and backup inbound program, a locally decoded stream (pre uplink) a return feed off the satellite, and the network’s final product via a DirecTV system. ESPN also requires additional monitoring equipment not necessarily found on news trucks, such as ASI stream monitoring (to monitor the quality of the MPEG stream from the encoder) and also SDI eye pattern analysis, to determine the quality of the serial digital signal coming into the truck. The multi-viewer is also handy for important news events, here the system is fully monitoring a 3-path interview with NSA Director Keith Alexander, all on one screen. Our Miranda multi-view system allows preset screen layouts to be quickly recalled for different kinds of events. A single path sporting event with 8 audio channels would have a totally different layout, with fewer but larger panels, and more audio meters. Comms: News requires multiple phone lines, typically 2 per path for IFB and intercom and the audio interfaces to go with them. 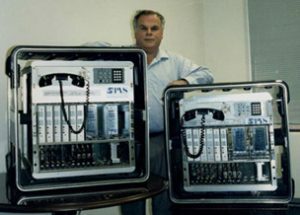 A sports backhaul only requires a simple stand-alone intercom to connect with the production truck. Some trucks that service only sports backhauls are not even equipped to do a news live shot. Four reporters from 4 different channels all need to hear their home anchors (IFB), and the producer needs to talk to the camera operators. This is level of comms is foreign territory for a sports-only backhaul truck! Redundancy: Our HD1 sat truck has 6 encoders that are all available for use with the understanding that if a producer wants to use all 6 paths, if one fails there will not be a backup for it. The fact that there are 5 other paths typically means that doing 6 is not “mission critical”. If failure becomes a concern, some extra encoders can be brought, maybe 2 spares for 6 live. But it would be very uncommon to have a full 6 backups for the 6 live paths. But in sports, there is always one backup for each transmission path. Since most sports backhauls are only 1 path, most trucks that do sports have 2 encoders, and they are always exactly matching pairs down to the firmware that runs them to enable the fastest switchover in the event of a problem. For multiple independant news liveshots, matching encoders are not necessary. Matching HD encoders for a sports broadcast. 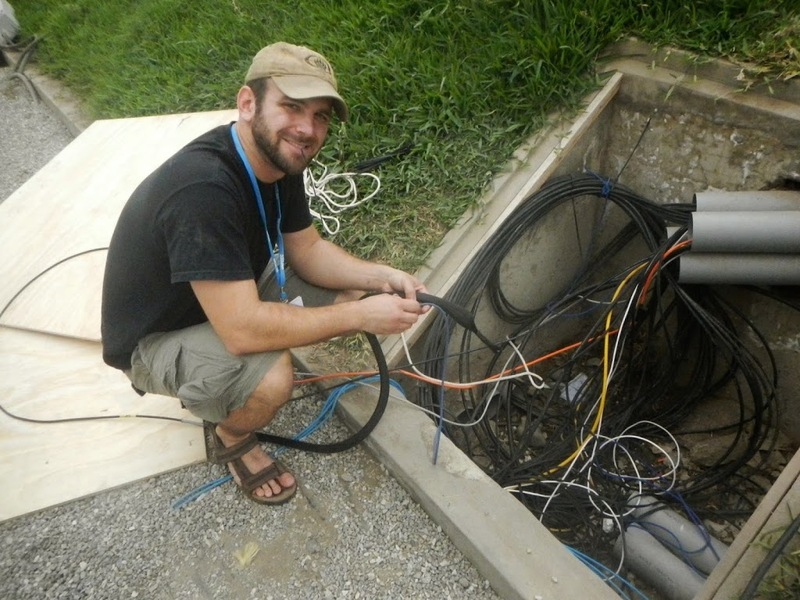 Self-Sufficiency: Covering a news event, especially while using a flyaway or at a natural disaster, the uplink engineer must be self-sufficient. Each camera that comes into the truck must be checked for quality, the operation of the generator, electrical loading for lights, HVAC, cabling, communications… all must be handled by the engineer. Often things are happening at a quick pace as a story develops, at a breaking story there is pressure to get a signal up immediately after arrival. 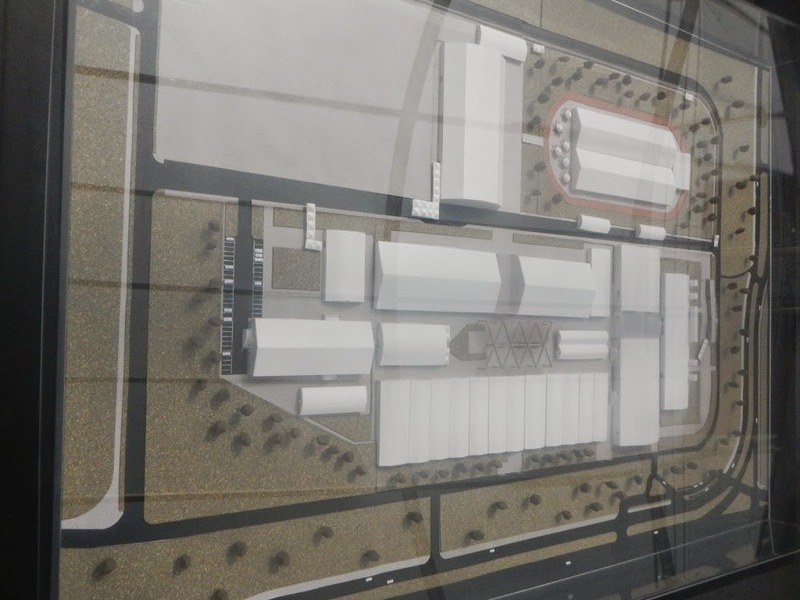 For sports, the pace is usually a little slower, as the events are pre-planned and should allow ample setup and testing time. At a sporting event, the uplink truck is often the last piece in a chain where dozens of people are in charge of different areas of a show. 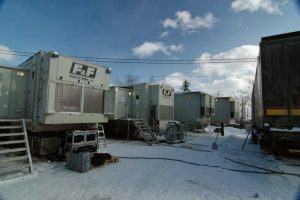 A large production trailer takes care of everything except the physical transmission of the program to the broadcasters. 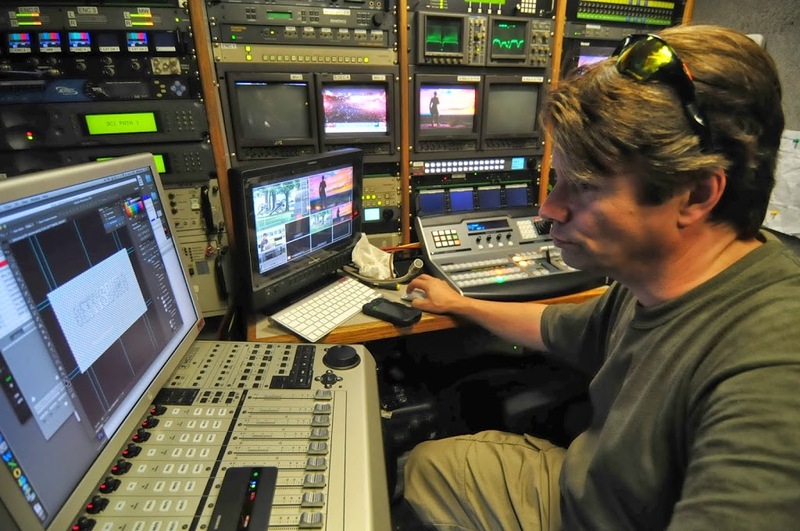 While the uplink engineer should be mindful of issues such as an over-exposed camera or clipping audio coming into the truck, these problems are usually addressed by other people quickly, whose only job is to adjust the cameras, or handle audio. Four 53′ Double Expando production trucks cover the World Cup Biathlon in Fort Kent, Maine. 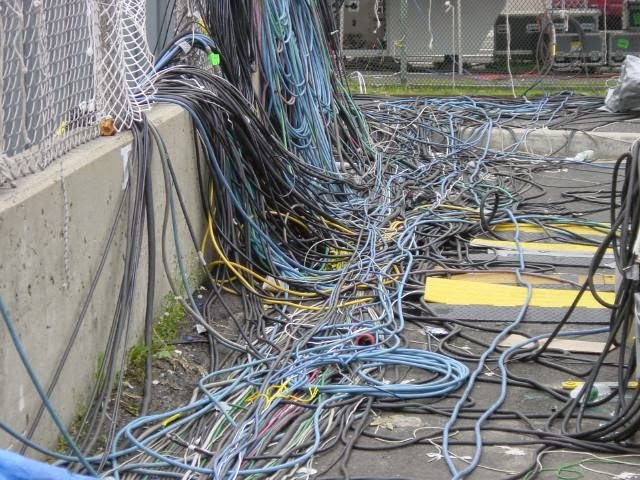 While the crews of these trucks pulled 15 miles of camera cables throughout the course, the uplink only needed about 50 feet, and that was provided by the production truck, and power was pulled by the electrician/generator operator. 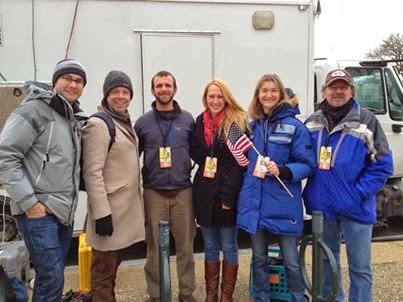 None of this massive setup was a worry of the uplink engineer, who only had to send one signal to Europe and figure out how not to freeze when walking from the crew shuttle to the truck. DCI‘s ESPN single path / 16 channel transmission certification means we are rated to broadcast events watched by millions of people with the required monitoring and backup for such a high-profile event. We can bring this same level of quality-assured transmission to any sporting event, from major leagues down to small college games! With extensive news experience around the world and now high-level sports certification, DCI is a well-rounded company able to tackle any kind of transmission requirement, anywhere. Contact DCI to see how we can put out experience to work for you in 2014. One of the biggest advantages of DVB (digital video broadcasting) transmission is the ability to transmit compressed video in a fraction of the bandwidth required for analog FM video. 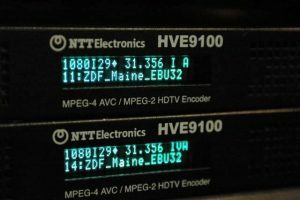 While encoding profiles have improved over the years, taking off with MPEG-2 and moving on to the current standard H.264 (MPEG-4) video, the basic transport stream that contains that data has remained the same. This signal is called ASI, or Asynchronous Serial Interface, which is based on a 270mbps clock, the same as the SD-SDI video interface, which allows it to pass through the same routers that handle SDI video. While SDI carries uncompressed serial data at 3 common bitrates (270mbps for SD, 1.5gbps for HD, and 3.0gbps for 1080p HD) ASI caries a transport stream of compressed MPEG data. One of the elements of the transport stream is Packet Identifiers, or PIDs. There is one PID number for each component of a transport stream coming out of an encoder, commonly there are two- one for video and one for a single audio pair. More complex streams can add additional PIDs for extra audios, closed captioning, or other ancillary data. A transport stream analyzer showing the PIDs from a simple encoder. 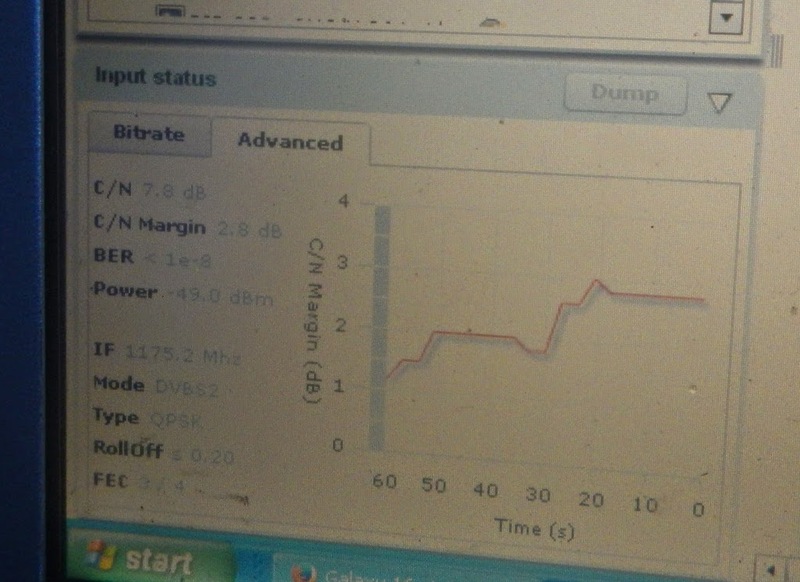 The PID number is shown, along with its content and total bandwidth on a bar graph. Here, the audio is 196kbps and the video is 4.2mbps, for a total stream of around 4.4mbps. Typically, in the news gathering world, there is one encoder per signal on the satellite, known as a SCPC, or Single Channel Per Carrier. On a busy satellite you may see dozens of these small signals next to each other. A single truck can transmit multiple SCPC signals for doing multiple video paths. A complex MCPC stream containing multiple channels, some with HD H.264 encoding and 4 pairs of audio (8 channels) for surround sound or multiple languages, along with some standard stereo feeds with SD MPEG-2 video encoding, all within the same stream. A multiplexer allows different kinds of encoded streams- from simple to complex- to be combined on a new stream. “Unknown” represents newer audio and video encoding methods that this analyzer does not recognize. A spectrum view showing 4 SCPC carriers on the left, and one large MCPC on the right, which may contain dozens of channels. Note- the size of a carrier does not necessarily mean its SCPC or MCPC, a full 36MHz transponder of HD MPEG-2 video is a SCPC, and a 9 MHz signal can contain a MCPC of several SD H.264 channels. An ASI stream analyzer can show exactly what is contained in a signal. DCI’s HD1 satellite truck and teleport have these advanced diagnostic tools. 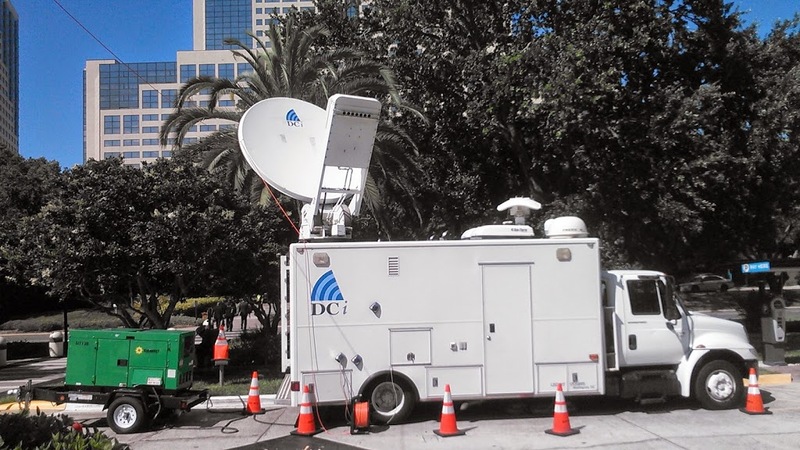 Both of DCI’s trucks and flyaway uplinks are equipped with Adtec DTA-3050 ten-channel muxes. They are not commonly used in the truck, but they are an excellent tool to have available. The flyaway however, is designed to use the mux exclusively for multiple path transmission. More efficient use of bandwidth. Separate, individual signals must leave space between the carriers to avoid interference. This is called guardband and is basically wasted space since there is no data being transmitted there. A single 18MHz carrier will carry more data than three 6MHz carriers with guardband between. Error correction is also not needlessly repeated. Linearity. This is the primary reason we use muxing on the flyaway. As more individual signals are fed into a typical tube amplifier, intermod is generated, which are spurious signals on harmonics of the primary signals. As more signals are added to the amplifier, more intermod is generated, and the amplifier must be run at a lower power to avoid these spurious signals from causing interference to other users of the satellite. So a 400w amplifier may only be able to use 200w before the intermod becomes unacceptable. By using a single signal to carry the required number of paths, the amplifier can be run at a much higher level. 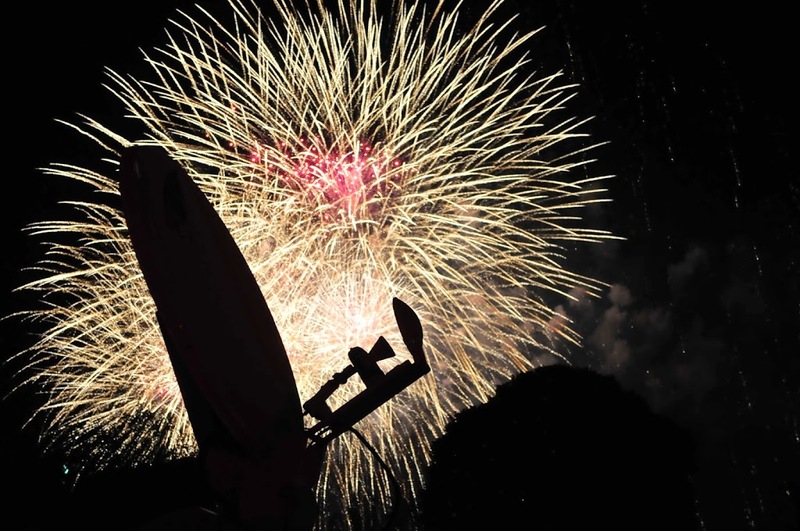 This is one of the main reasons we can operate so many paths off a small airline-checkable flyaway dish. Less Equipment. Using SCPC, each path requires a modulator to go with the encoder. 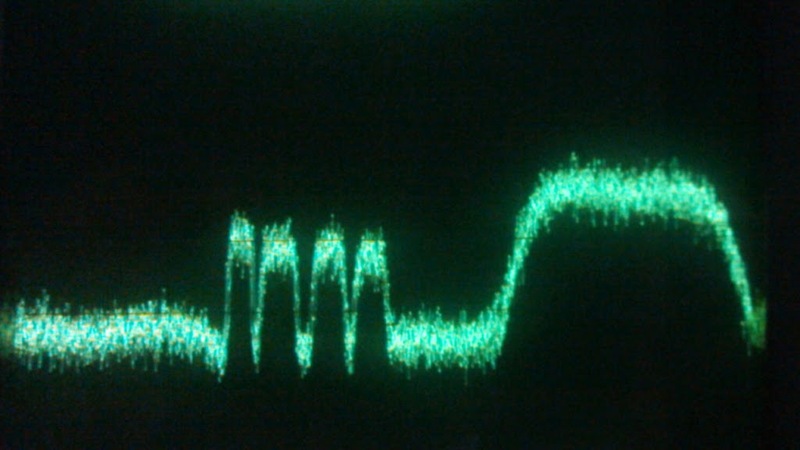 The modulator takes the ASI and turns it into a radio signal. Using MCPC, all the encoders feed into the mux, and that feeds a single modulator. Of course, for redundancy we always carry a spare modulator, but it saves a lot of space to not need a modulator for every transmission path. ASI analysis of a mux carrier from Lousiania PBS. This mux also contains some data channels. Availability. Unlike individual carriers that can be turned on and off on demand, a mux is a single carrier and it is not possible to remove paths without reconfiguring the entire mux and changing the modulator and receiver settings for a new bandwidth. In a news event, a client may want to add and remove extra paths as the story requires to save money on bandwidth. Using a mux, that is not possible. Muxes are best suited for feeds where the number of paths required is likely to stay the same. 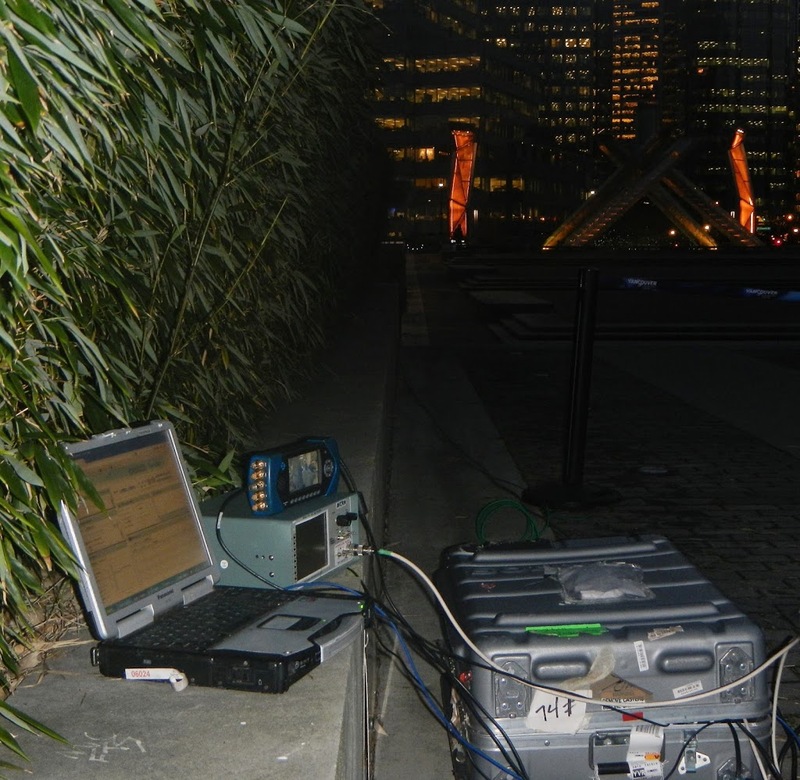 The mux remains a very powerful tool in our kit to allow previously impossible results from our flyaway uplink. 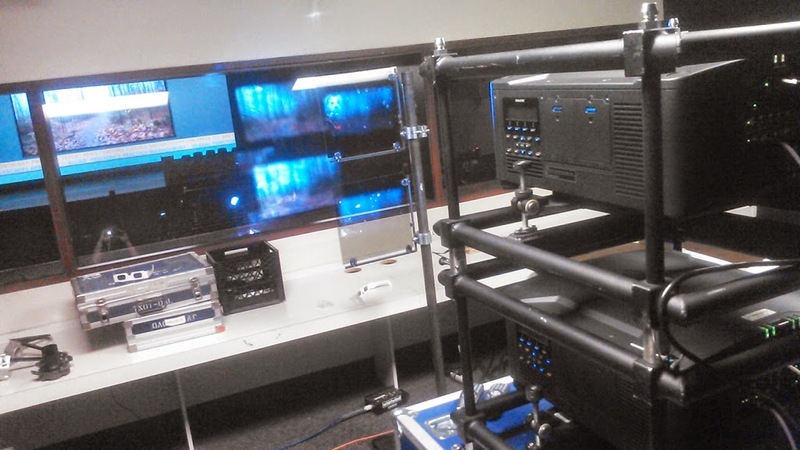 Contact DCI to learn how we can apply this and other technologies to your video transmission needs.